May’s flowers are finally here, and they were heralded by one of our country’s most beloved (and slightly ridiculous) traditions: the Kentucky Derby. Every year, the first Saturday in May brings a slew of over-sized hats and equestrian fanatics together for a nearly 140-year-old sporting event. 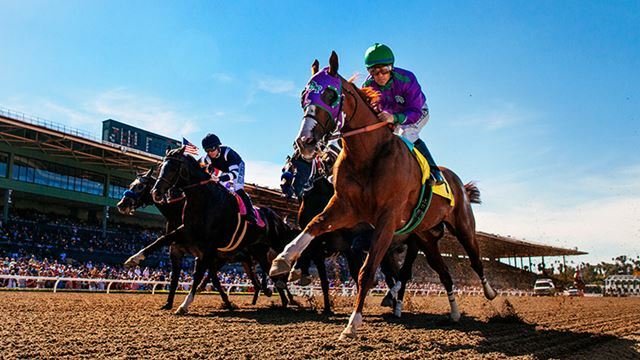 This year’s race was won by a horse named California Chrome (pictured above*). For those of us who celebrate the race with food and drinks, there’s one vital ingredient: bourbon. We’re not talking just any old whiskey – Derby parties call for the barrel-aged, Kentucky-bred, high-proof real deal. 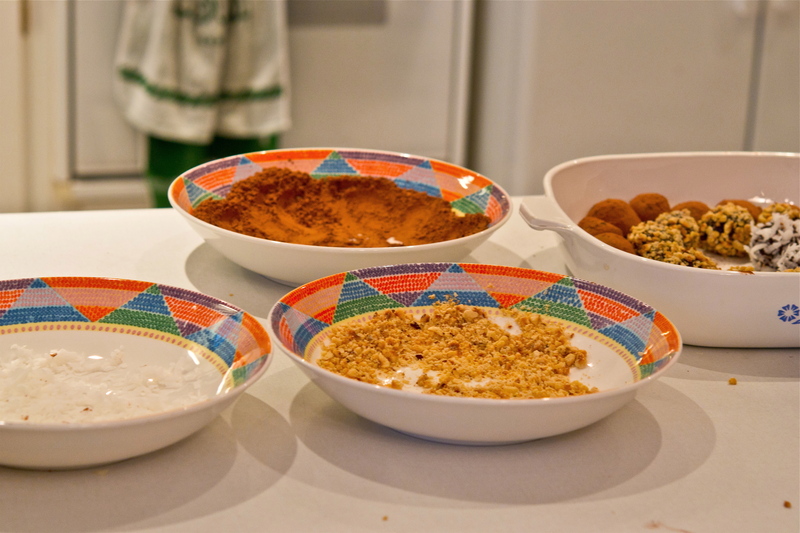 Let’s start with the smallest of the three – these treats are both simple and addictive. You know you’ve got a winner when the main ingredients are cookies, nuts, and chocolate. I’ve made a similar recipe using spiced rum (see HERE) but the bourbon variety is by far my favorite. There are actually two ways to make bourbon balls: the first is the method I used, while the second omits the cookies entirely and relies on a powdered sugar and bourbon filling. It’s fairly sweet, with a more pronounced bourbon taste (the cookies help round it out, for obvious reasons). You’ll need a few hours to pull these together, and a bit of patience – the filling prep and rolling aren’t an issue, but dipping the pieces into chocolate can be a bit messy. Melted chocolate is an ingredient that manages to get onto everything, so I have the setup ready to go before even melting the chocolate. The key is to keep the the bourbon balls cold for as long as possible. I froze all the pieces, and then dipped 1/3 into the chocolate while the others remained chilled. Since it’s a no-bake recipe, use a bourbon that you would actually want to drink – these treats will only be as good as the alcohol you use. I used Jim Beam for all three recipes. 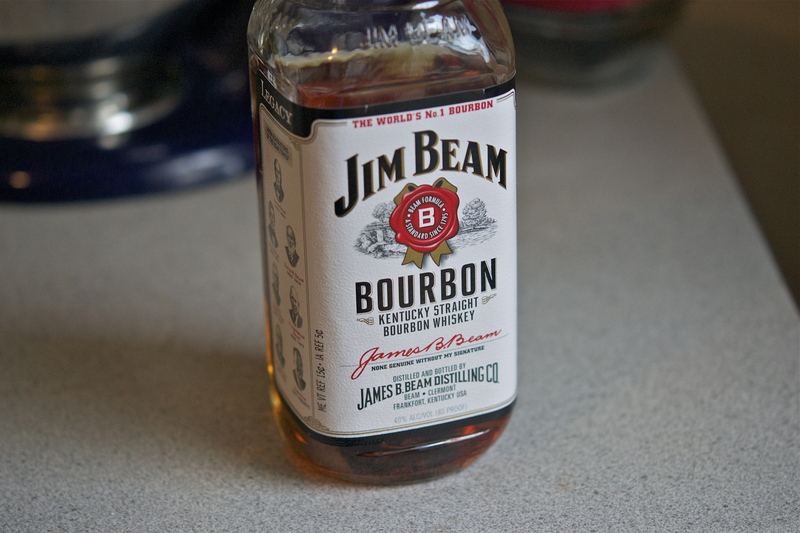 That being said, I’m admittedly a bit of a bourbon snob and would never drink the stuff unless absolutely necessary – I can thank my friend Beth for that! The resulting bites were perfectly delicious, and there were hardly leftovers by the end of the party. 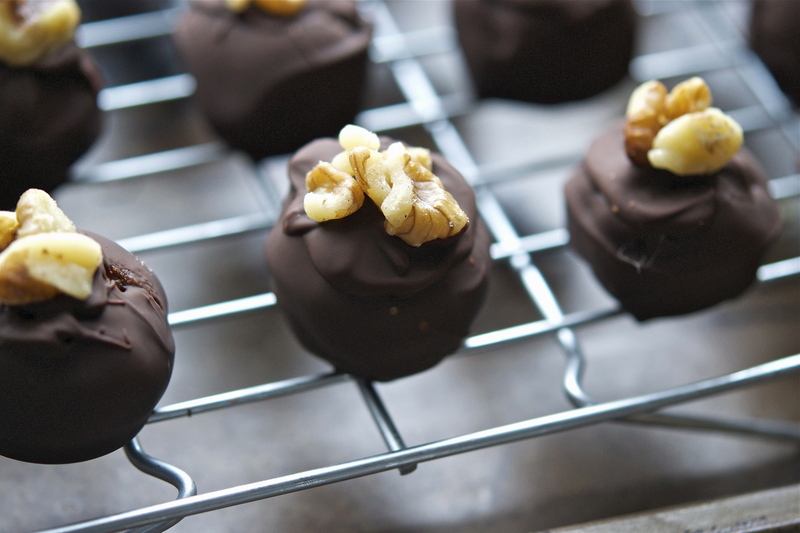 Click HERE to see the recipe for these chocolate-covered treats! 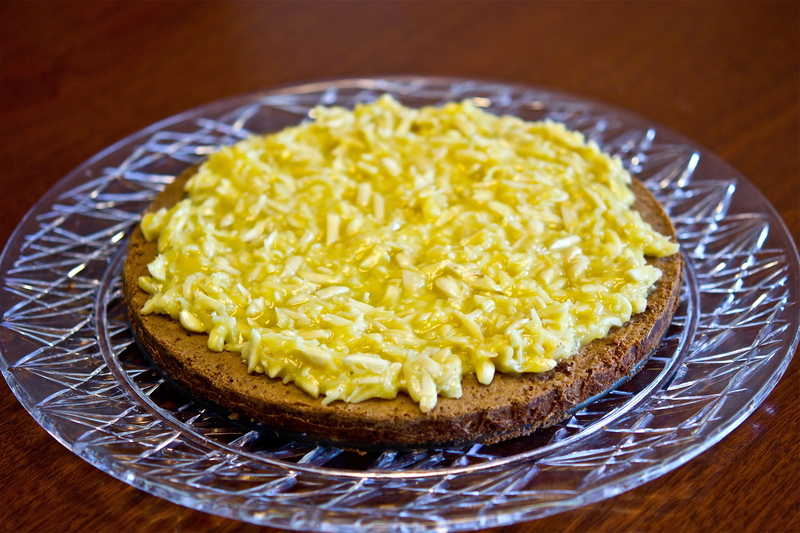 The second recipe was a twist on a classic dessert that I’ve been making for years. 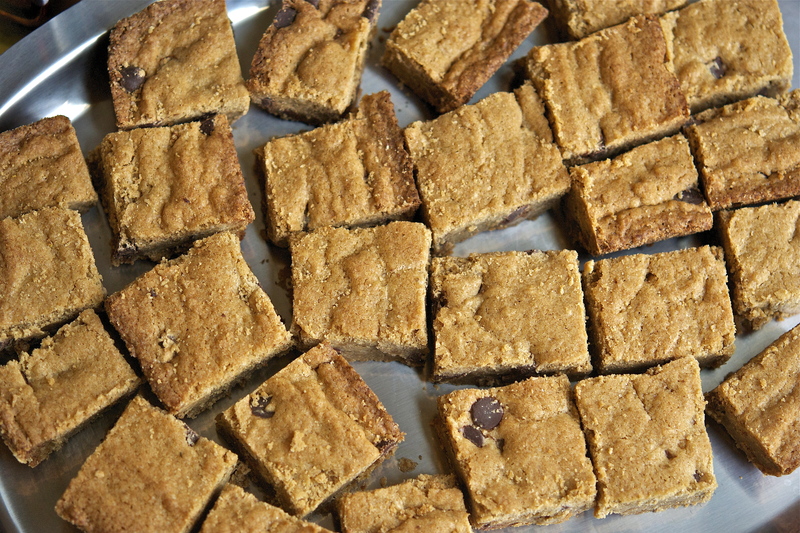 Blondies are basically brownies, but with brown sugar replacing the chocolate. Like brownies, you can fill ’em with nuts, chocolate chips, candies, and more. 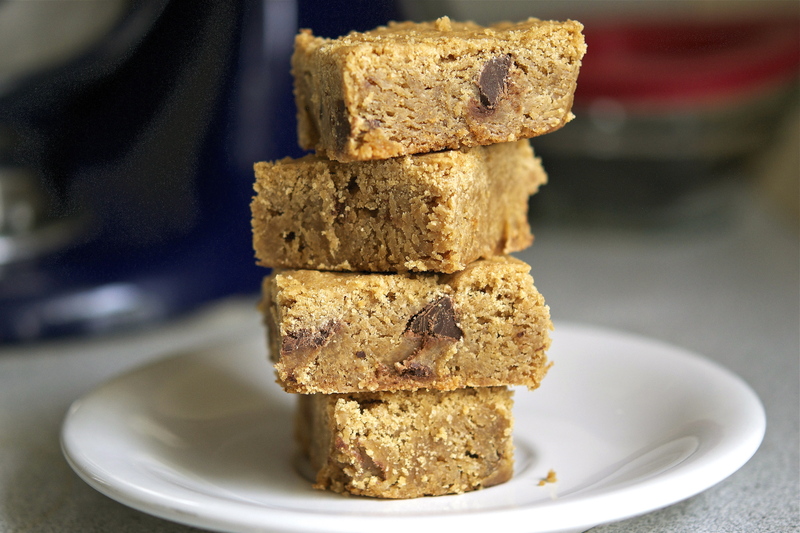 These blondies take it to a whole new level with browned butter AND bourbon. The first ingredient is a recent discovery of mine (see here), and is honestly a game-changer in the world of baking. 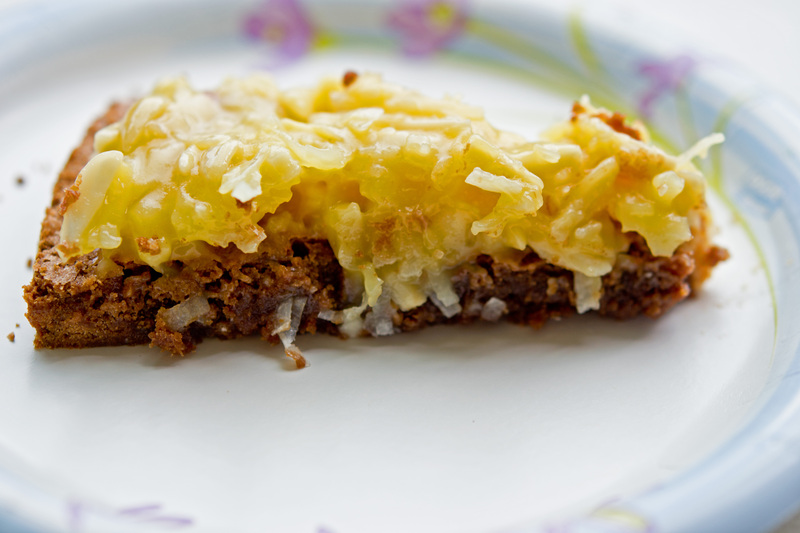 The resulting bar was nutty and moist, with a hint of bourbon that rounded out the sweetness. They store beautifully, making them the perfect treat for picnics and parties. You can use dark or white chocolate, or even crushed walnuts. That’s the best thing about bars – you can make them your own, and they’ll still be just as delicious no matter what. One bite of this blondie and you’ll never go back – browned butter and bourbon will be your kitchen standbys. Click HERE to see the recipe for these golden beauties. This last dessert was an experiment – I had found a GREAT recipe for bourbon chocolate cupcakes, but didn’t have nearly enough time to prepare the remaining components. I was left with a base recipe and no idea on what to do for frosting or filling. I ended up making a bourbon ganache, and it was a winner. This was a fairly basic ganache, with a splash of bourbon and touch of vanilla. Any extra ganache will keep in the refrigerator for a week (boozy ice cream sundaes, anyone?) For those who aren’t as keen on the bourbon taste, coffee or even milk make wonderful substitutes. As is, these are definitely cupcakes for adults. 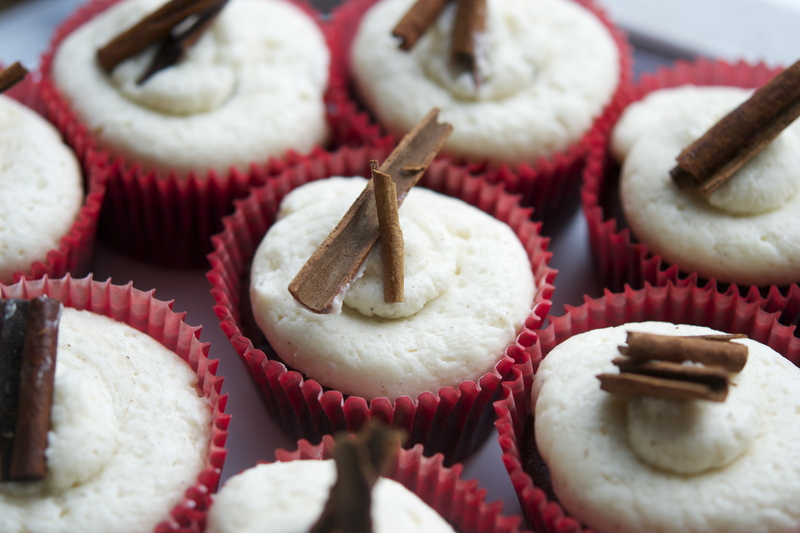 I wanted a frosting to complement the bourbon spice, and whipped up a cinnamon buttercream. Again, a fairly basic recipe with a small twist – it was the perfect complement to an already stunning set of flavors. 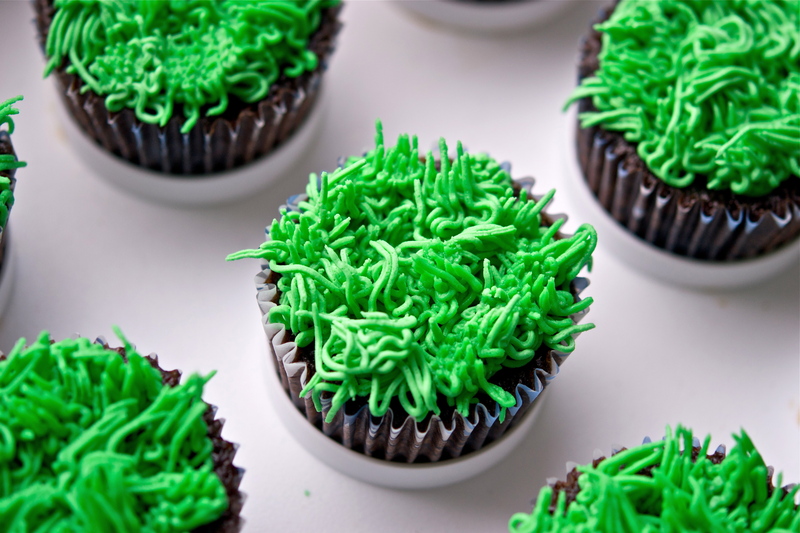 I was hoping to find a decorative Derby garnish (like this), but ended up crushing cinnamon sticks and arranging the pieces atop the frosting. The result was an intensely flavorful cupcake, all of which were demolished before the night’s end. 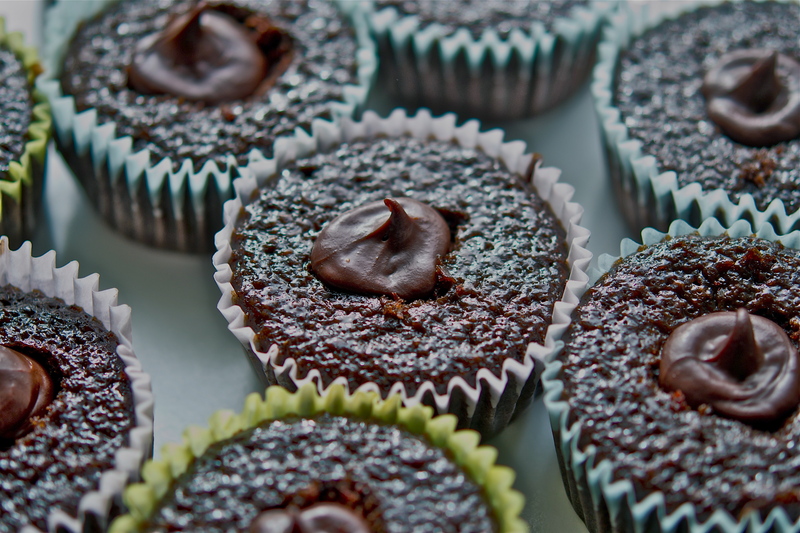 Click HERE to see the recipe for these devilish cakes. I grew up loving horses – they are magnificent animals, and have been a vital part of our culture for centuries. The Kentucky Derby showcases the best of the best: thoroughbreds whose pedigree and training have made them amongst the most valuable animals in the world. The average speed of a thoroughbred is about 36 mph, and can go up to nearly 40 mph. Like I said, they are truly remarkable creatures. For the musical pairing, I chose a classic “horse-themed” work: Franz von Suppé’s Overture to the Operetta Leichte Kavallerie (Light Cavalry). Premiered in 1866, the operetta itself is fairly esoteric and is rarely (if ever) performed. The overture, however, has stood the test of time and has become to most well-known composition of Suppé’s legacy. The operatta’s story doesn’t contain any actual horses or riders – it concerns the love affair of a Baron and a Hungarian countess. Nevertheless, the overture’s thematic material has come to be closely associated with horse-racing and actual cavalries. It’s a classic, and a perfect pairing for an event as time-honored and exciting as the Kentucky Derby. The below recording comes from the Vienna Philharmonic Orchestra’s New Years Concert, with conductor Franz Welser-Möst – enjoy! A New Year of Cookies! HAPPY NEW YEAR!!! At some point, remind me to share with all of you how crazy/wonderful/beautiful 2013 was – but for now, I’d like to kick off 2014 with something we all know and love: NUTELLA. The chocolatey hazelnut spread has become a worldwide phenomenon, and this is not an exaggeration. 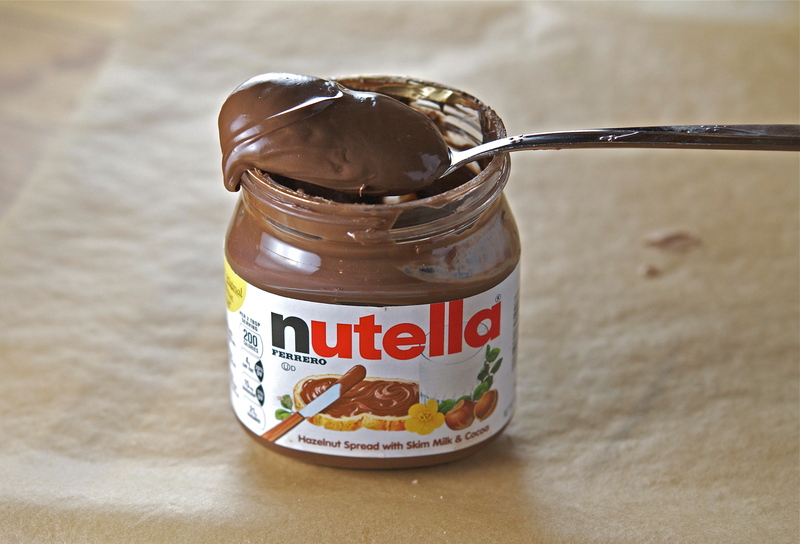 Every 2.5 seconds, a jar of Nutella is sold to a chocoholic in the world. To put this into context: the total number of jars sold in a single year can cover the Great Wall of China 8 times, and can be spread over more than 1,000 football fields! If that’s not enough to convince you, there is an annual World Nutella Day – on February 5th, fans across the globe post drool-worthy foodie pics and share what they love most about the sweet spread. 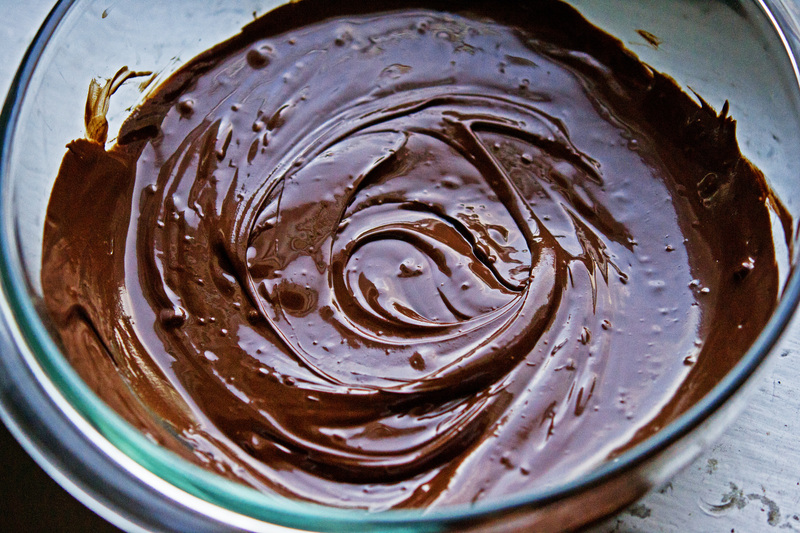 Needless to say, Nutella is pretty amazing and (for some) worth more than its weight in gold. With that in mind, let me introduce you to these two “drool-worthy” cookie recipes: Vanilla Bean Macarons with Nutella Buttercream and Nutella-Stuffed Brown Butter Chocolate Chip Cookies. (Word of warning – these do NOT adhere to any New Year’s Resolution efforts). French macarons are a project I’ve been meaning to try for quite some time – each cookie consists of two almond-meringue shells with a filling of choice (ex: buttercream, jam, ganache). 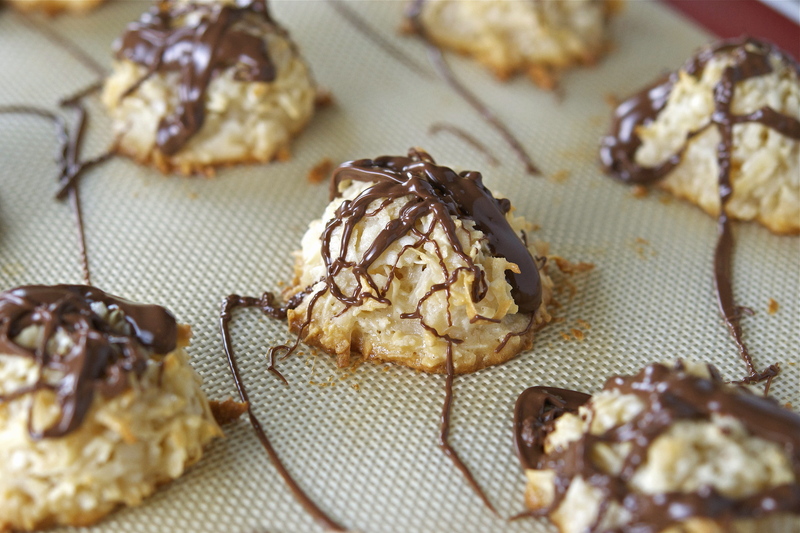 It’s often confused with “macaroon” – a similar cookie that lacks a filling and is popularly made with coconut (scroll to the end of this post!) The French macaron has a more distinct shape: its top is smooth and round, with a ruffled edge (called the pied) and a flat base. Flavors and colors are easy to customize, hence my choice of vanilla bean and nutella. Every baker has his or her own opinion about how to make the perfect macaron, but it really comes down to preference and experience – if the “macaron” shoe fits, stick with it. While some people have the ability to pipe perfectly-sized macarons, I don’t trust my own skills just yet. 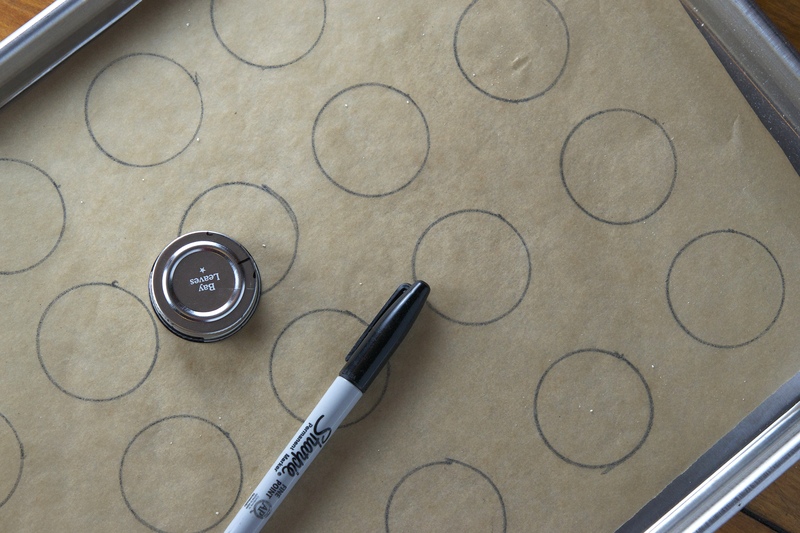 To make a visual guide, I traced small circles on to a piece of parchment paper and then flipped the paper ink-side down. Aside from this, there are two other tricks for getting the right shape and look. 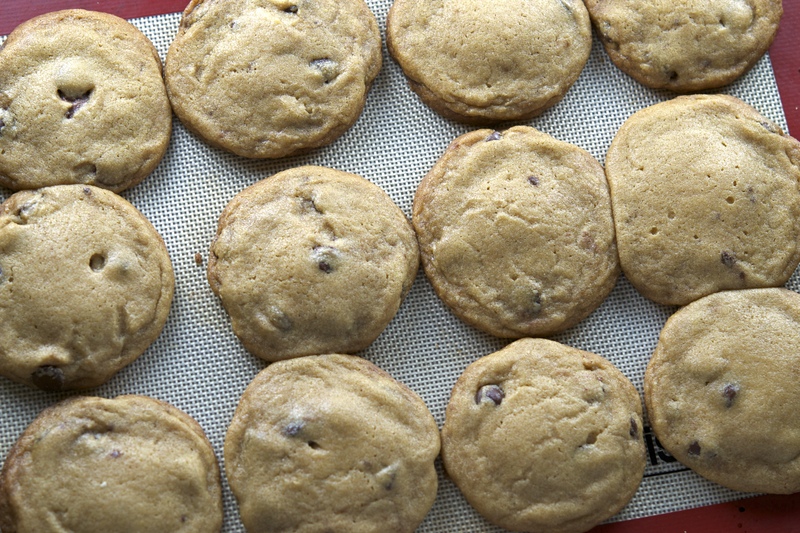 The first is rapping the pan against the counter – not so hard that the cookies goes flying, but with enough force to loosen any air bubbles trapped inside. The second is to allow the batter to sit for 15 to 30 minutes: this creates a shell (the batter should not be “tacky” before going into the oven) and allows the coveted pied to form while baking. The filling is perhaps the easiest part – you can go plain Jane by choosing your favorite jam, or you can whip up a flavored buttercream or chocolate ganache. As you already know, I made a Nutella buttercream for my macarons…which I proceeded to lick out of the bowl once the cookies were done (no shame). 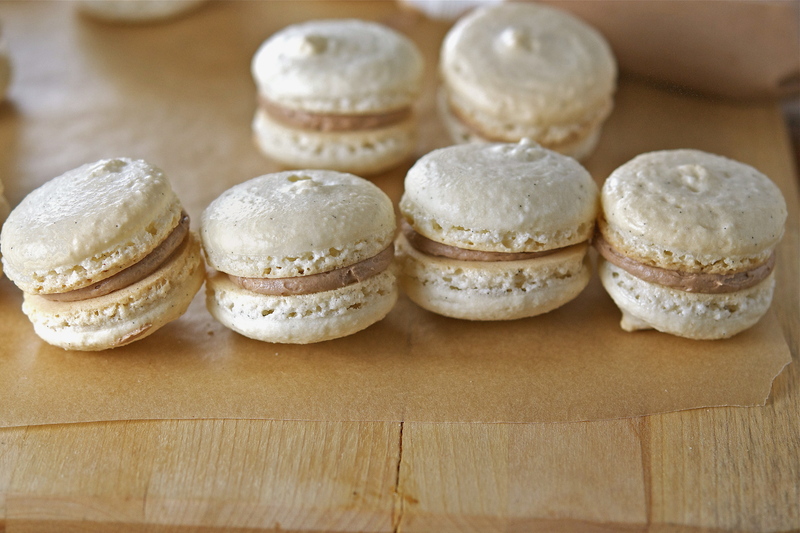 It took me a while to give macarons at try, but they are really quite simple once you get the feel for it – click HERE to see the recipe, which also includes some helpful tips. One thing I absolutely recommend is freezing the Nutella, and then eating it directly out of the freezer. 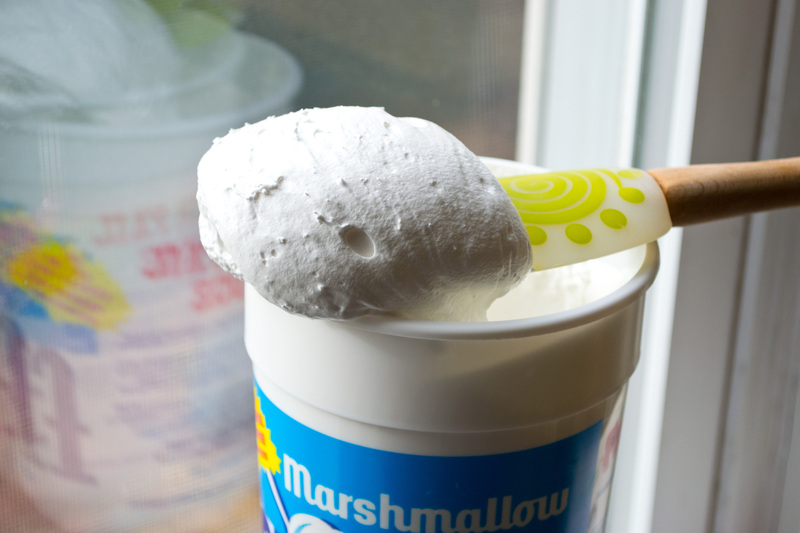 The original recipe calls for chilling the spread in your fridge, then using a teaspoon measure to scoop it out. Our building’s heat is kept at tropical highs during the winter (thanks to a disengaged management company) so I needed a better solution. 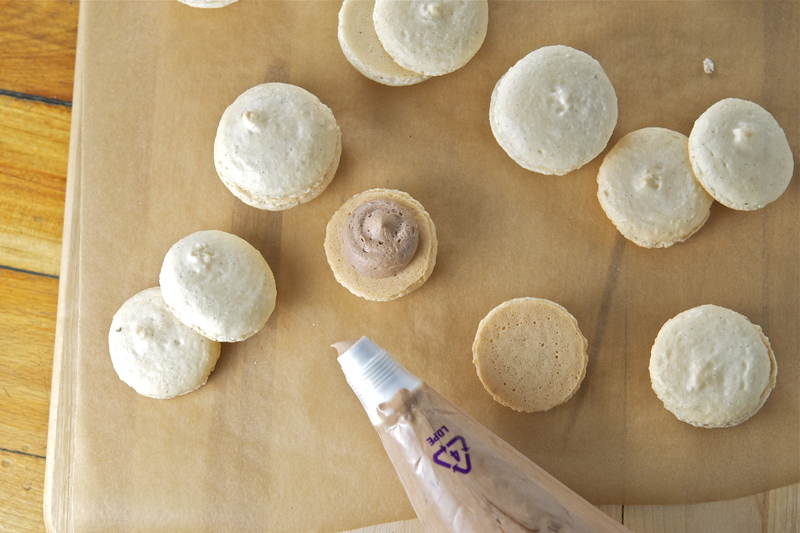 I froze teaspoon-sized dollops of Nutella the night before baking, which resulted in a much friendlier process. 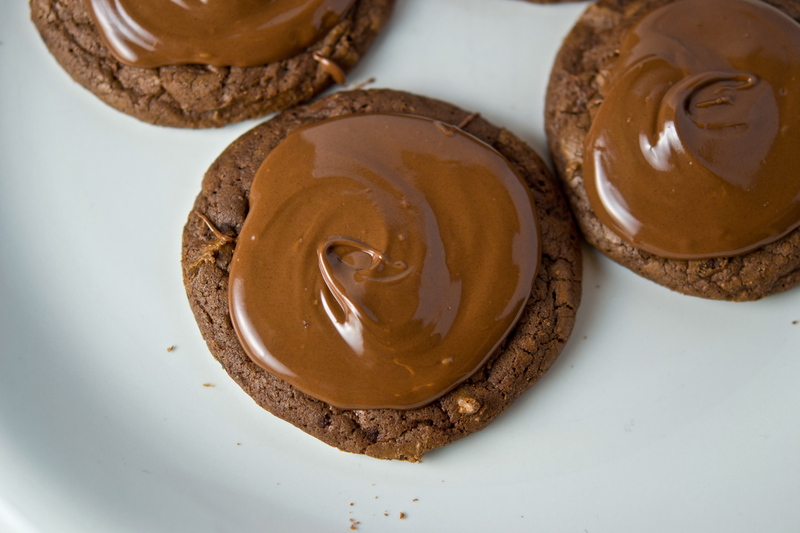 The Nutella “coins” could easily be wrapped with the cookie dough, mess-free. 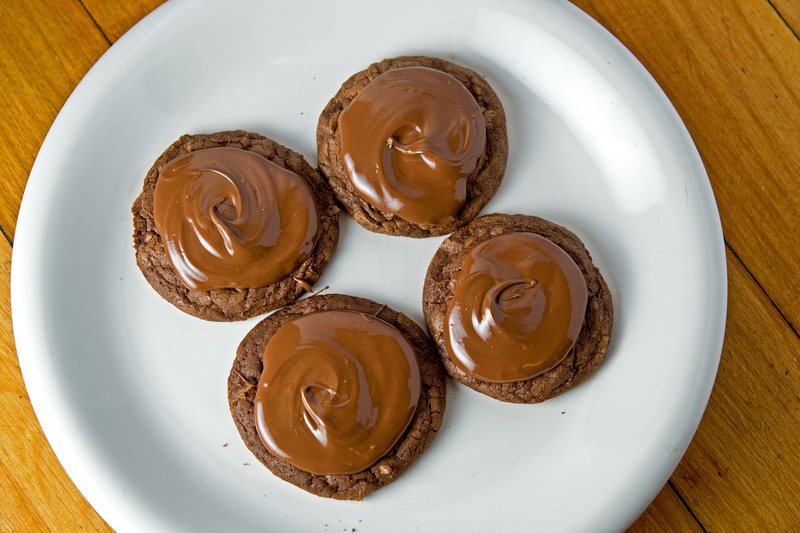 These cookies with bursting with a nutty, chocolatey aroma when pulled out of the oven. Once cooled, I wrapped as many as possible into candy bags for gifting…because I would have eaten all of them, and needed to save myself from a “Garfield sees lasagna” moment. Carrying them into work was comical, considering people on the train were visibly intrigued by the smell of chocolatey goodness. This is not your average chocolate chip cookie, but it will quickly become one of your favorites – click HERE to learn how to make these devilish treats! New Year’s bonus cookie! 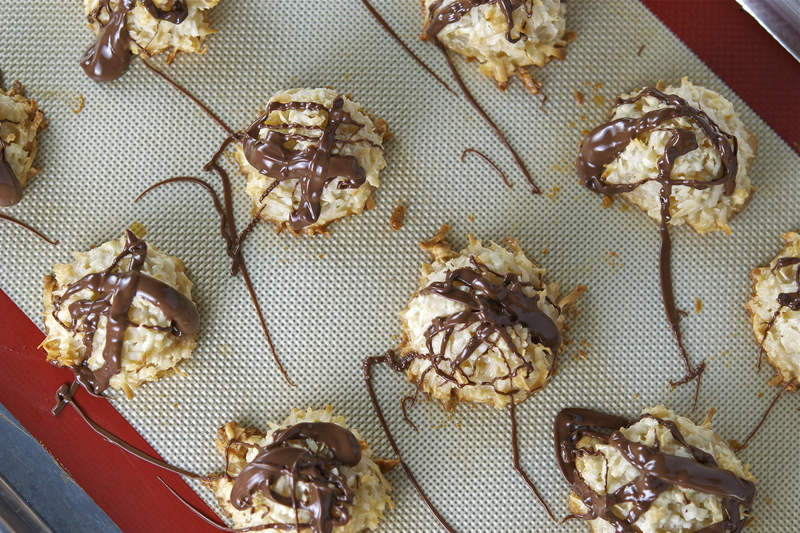 I also made some Coconut Macaroons drizzled with Nutella. I had several parties to attend on New Year’s Eve so…the more the merrier! This is one of my favorite cookie recipes – they are a cinch to make, with only 5 ingredients (minus the chocolate). What better way to treat your friends than with a platter of macarons AND macaroons?? 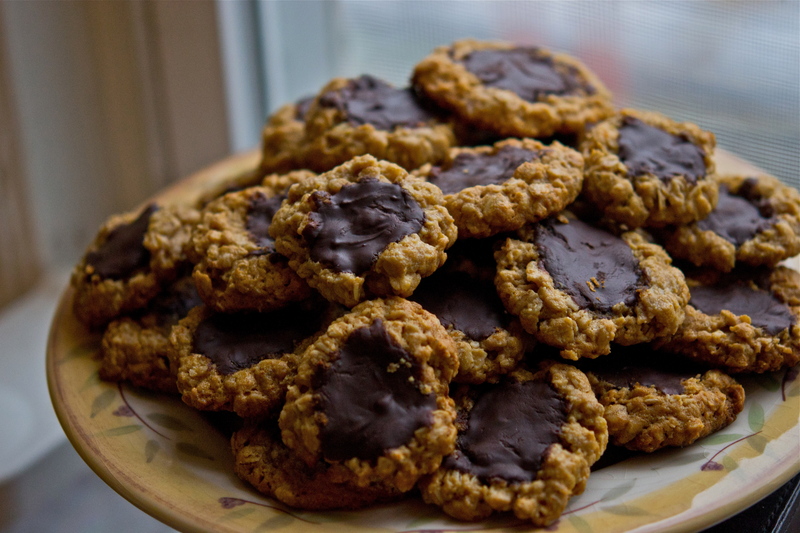 Click HERE to see the recipe for these delightful cookies! January 1st brings with it a fresh start – unknown adventures and new opportunities await. It is a cause for celebration that’s echoed across the globe. New Year’s Eve is filled with excited anticipation, and the day itself seems somewhat brighter and clearer (even if it’s painfully cold…like it is today in Boston). The festive ambiance is contagious, as cities and entire nations join together to welcome a new start. 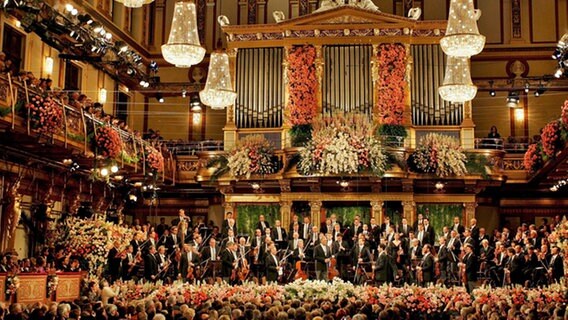 One celebration that’s worth noting is the New Year’s Concert with the Vienna Philharmonic – a tradition that dates all the way back to 1939. Today, the performance is broadcast to an audience of nearly 50 million people! On the morning of New Year’s day, the Vienna Phil gives a concert that showcases a number of classics by Austrian composers. Most of the program includes pieces by the Strauss family. In fact, the 1939 performance contained works by only Johann Strauss. This brings me to my musical pairing: Johann Strauss’ Overture to the operetta Die Fledermaus. This piece – which was on the original 1939 New Year’s program – is the perfect example of “light music.” It contains some wonderful gems, and gives you a taste what’s in store for the operetta itself. That being said, the technical aspects and musicality of the overture are quite demanding on the musicians – what better orchestra to meet the challenge than the Vienna Phil! The below recording is from the New Year’s Concert with the Vienna Philharmonic in 2010. Both exciting and cheerful, this overture is a lovely way to ring in the New Year! After what has felt like nonstop traveling, I am BACK in Boston 😀 It was an awesome three months do doubt, though it’s nice to finally have a moment to relax and enjoy my own apartment. I feel like I haven’t blogged in forever! Of course, the traveling has meant little to no chance for foodie adventures and photography…thankfully, I had photographed some sugary treats a while back that had yet to be featured on this blog! 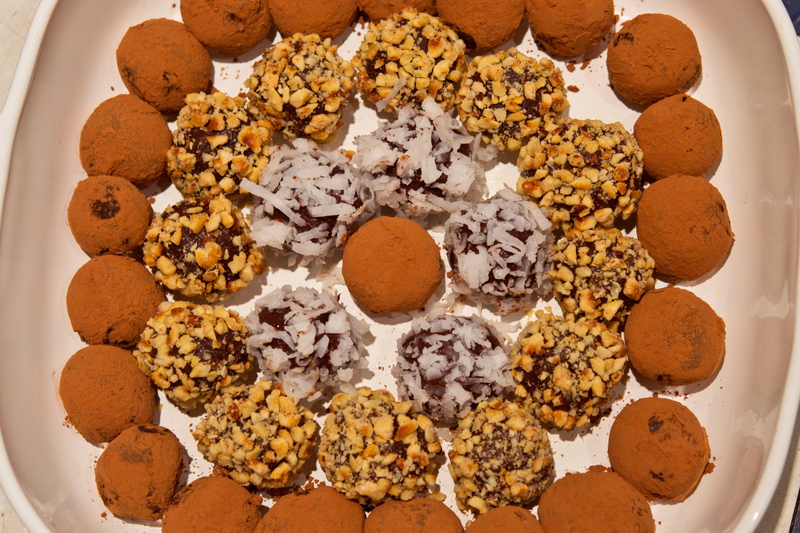 Chocolate Truffles are perhaps one of the most luxurious sweets, and yet they are so easy to make! My recommendation: use THE best chocolate that money can buy – Ghirardelli, Godiva, Scharffen Berger, Green & Black’s, etc. It’s the main ingredient, and will make all the difference in the world (especially if you don’t plan on using any added flavors). Adding a flavor is where the fun really begins – peppermint, pecans, bourbon, cinnamon, Grand Marnier, espresso (I could go on…). 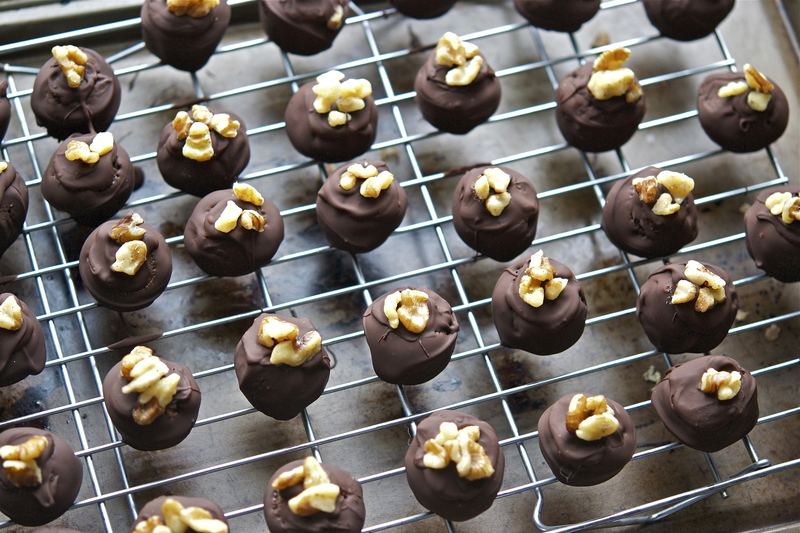 Just be sure to stick with ingredients that won’t entirely overwhelm the taste of the chocolate (after all, these are chocolate truffles). From there, you can roll them in any coating (that’s edible) – we went for a combination of sprinkles, chopped nuts, powdered sugar, and even coconut! Some other ideas might be crushed cereal, decorative sugar, pretzels (but don’t get crazy!) The result was is quite stunning, and so rich! They can be a little messy, but I was recently given a trick: coat your hands in cocoa powder, then roll them into balls – so simple! Have several bowls set out with your desired coatings, and I would quickly washing your hands in between coatings, unless you want a truffle that is covered in every one…which is OK! 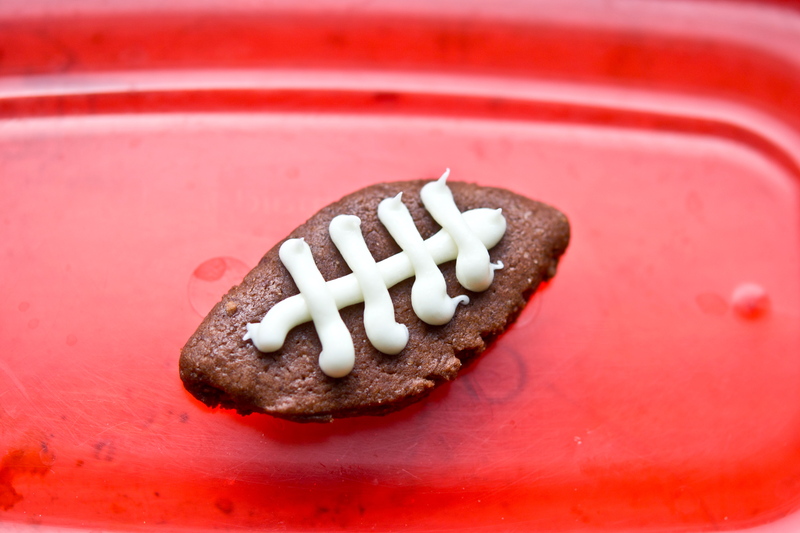 Click HERE to read more about these bite-sized treats. The original recipe calls for icing, yet I felt these already have the perfect balance of sugar and spice. For fans of a sweeter cookie, then you would love the icing – and it would also bring these even closer to their pastry inspiration. If you are bringing these to a party and want to box them up, I would recommend icing the cookies once you arrive. Just make sure your guests don’t steal any while you’re working – I can guarantee they will be tempted to try. Click HERE to read more about these beautiful cookies. 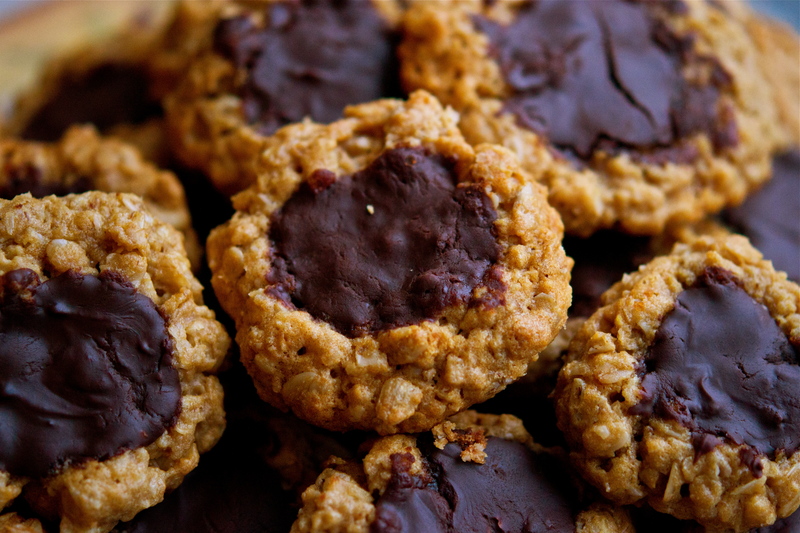 All I can say about these Peanut Butter & Fudge Oatmeal Cookies is that they are dangerous – once you’ve had one, you’ll want at least 3 (or 12) more. They are actually gluten-free, which is a great option if you or a friend is sensitive to gluten products. Everything else about them is pure indulgence: peanut butter, chocolate fudge…they are just really good. I could talk more about them, but wouldn’t want you to accidentally drool on your keyboard – click HERE to read more about these chocolatey bites. So where is the connection to these cookies? Cookies in and of themselves are edible stories – each has its own history, whether it be your mother’s beloved chocolate chip recipe or from a holiday cookie swap at your office that was a lot fun. The original below recording is with cellist Yuli Turovsky and the chamber orchestra I Musici de Montréal – enjoy! 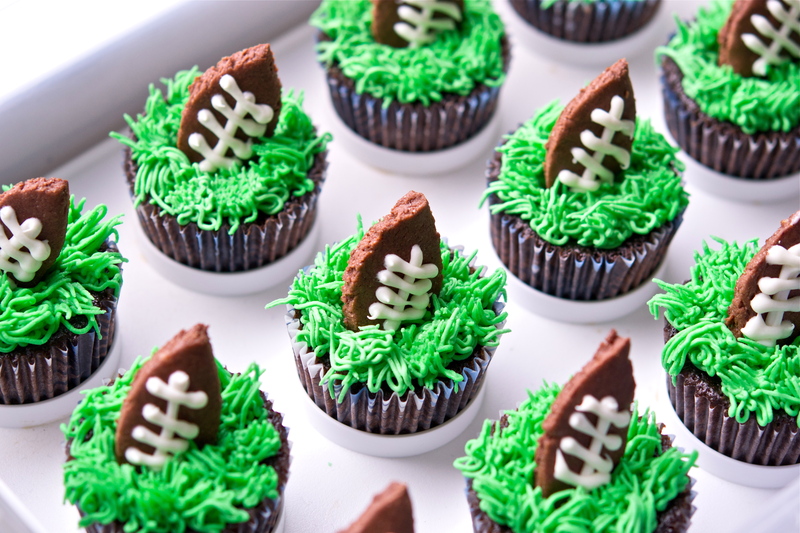 Superbowl – a word that, for sports fans, is synonymous with “event of the year”. It’s the one time that you can actually get away with having nothing more than nachos and beer for dinner…with a side of buffalo wings and mozzarella sticks and guacamole and…well, you get the picture. 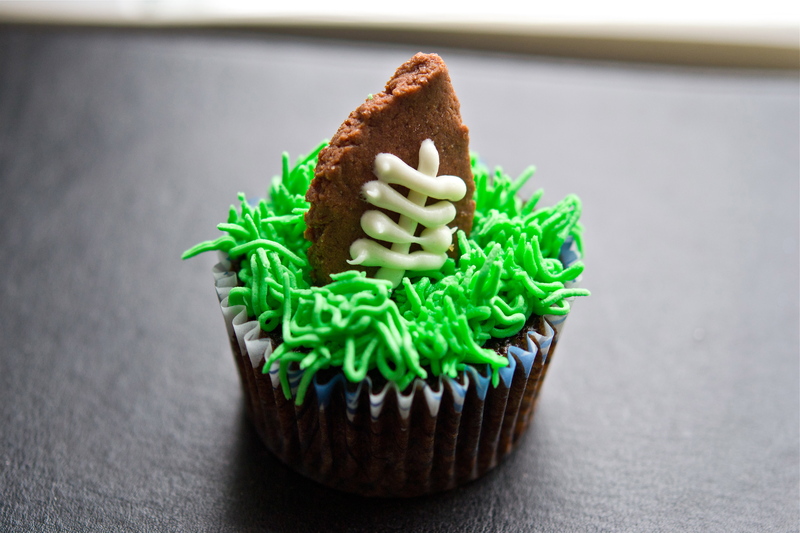 I always take advantage of these occasions to make something fun and delicious – so for Super Bowl, I made adorable Touchdown Cupcakes! 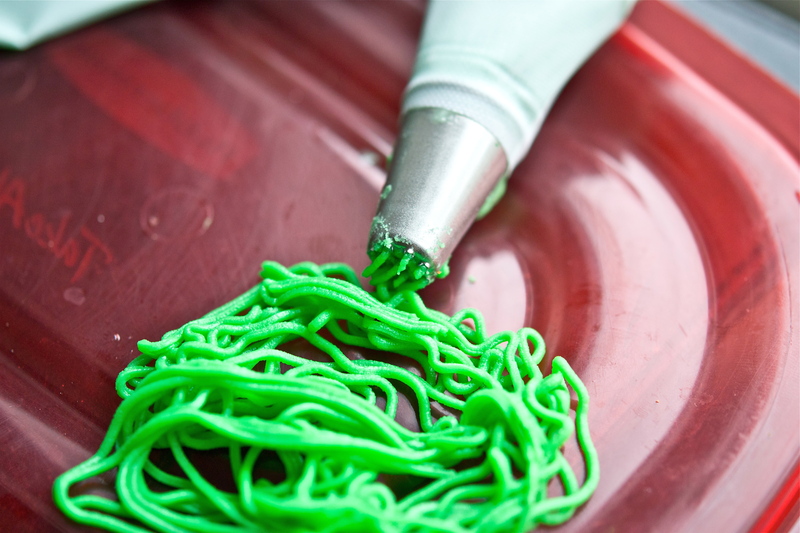 I have always wondered what the “grass” piping tip would produce – I personally am reminded of silly string…but maybe that’s just me. It’s actual “spout” resembles a shower head. I would recommend using a standard buttercream recipe, but you might be able to try it with cream cheese. The piping tip has very small holes, so a stiffer frosting will be difficult – adding some milk or cream can help loosen the consistency. You start to get the hang of the piping pattern after a while, though it is time-consuming. Breaking into noisy arguments all around! With a din that tears the place apart! They’re celebrating men of valor! Celebrating the brave of heart! Let’s go! On guard! Let’s go! Ah! My roommate Synthia Pullum (a ridiculously talented soprano…and Anime enthusiast!) recommended the following recording with baritone Dmitri Hvorostovsky – enjoy! So folks, I did it again – word got out that I know how to bake, and I’ve become the “cupcake guru” with friends and loved ones. To be perfectly honest, I really enjoy it – there’s something almost therapeutic (for me) in baking, decorating, and delivering a batch of treats…in fact, it has few parallels. It’s a finished product, and one that you can receive direct feedback on. 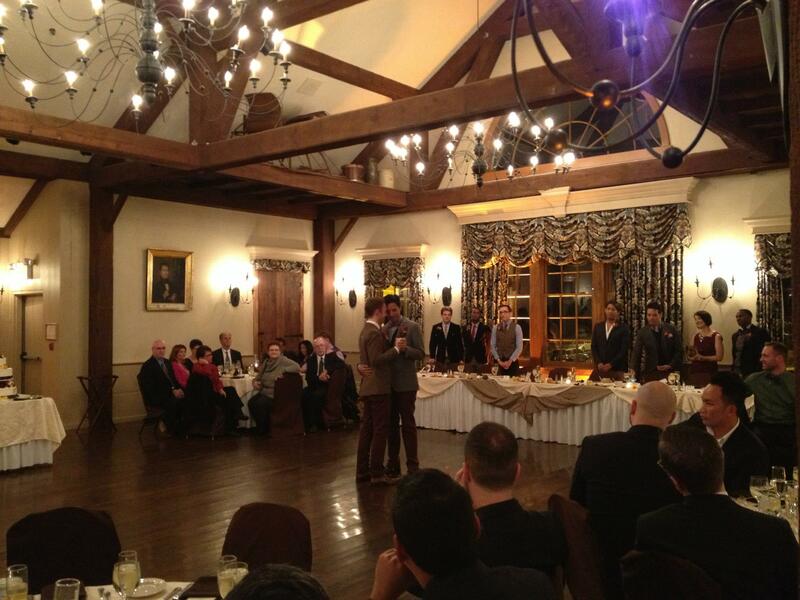 So in this instance, two very close friends of mine recently said “I do” – Robert Myers and Brandon Martinez. It was perhaps one of the most beautiful services I’ve ever seen (I cry in the movie Bambi, so of course I was a basket case). 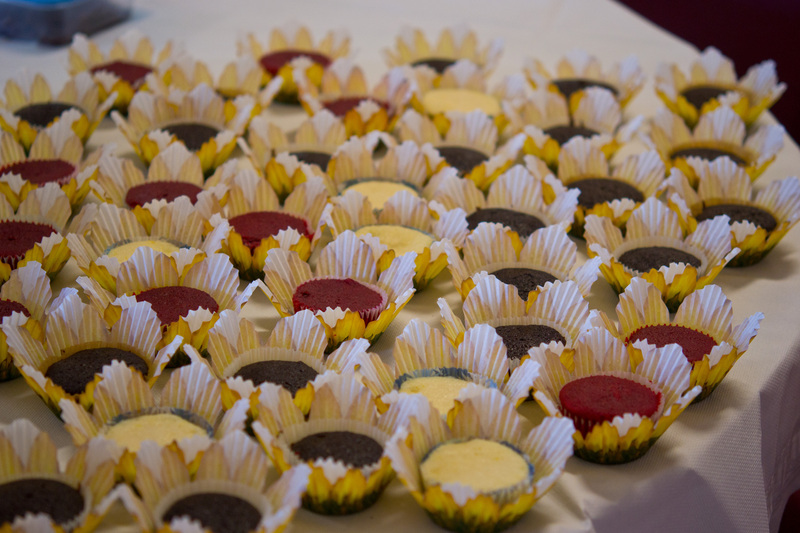 Like the last wedding I baked for, I had three varieties of cupcakes – the comedy and stress of making 150 cupcakes and getting them to the wedding (pictured above), once again, totally worth it. 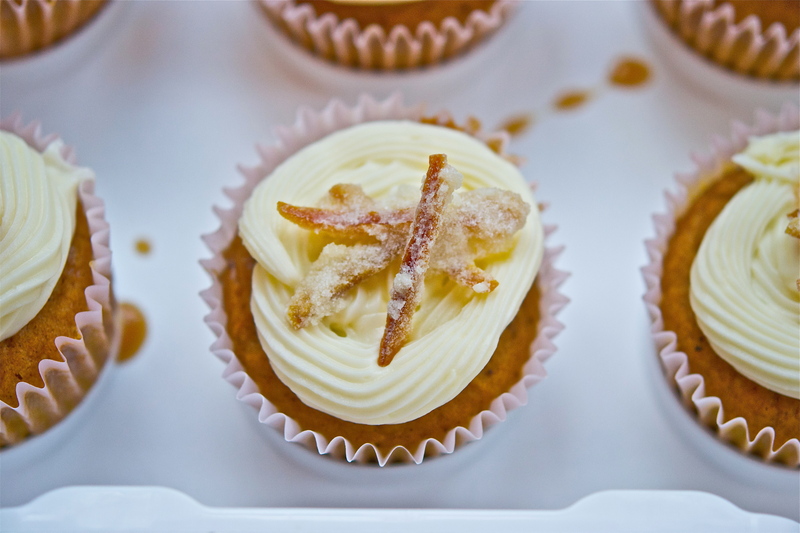 The hardest part of these cupcakes was the garnish : candied orange peel. I got a serious burn from these puppies (but that’s what I get for attempting an “Iron Chef” adroitness with boiled sugar…never again). They are a beautiful topping, but be warned – boiled sugar is a dangerous ingredient. Caramels, nut brittles – the secret lies in the risk. What’s funny about the caramel for these cupcakes is that it never reached the thickness I had planned for…and the result was a thin sauce that soaked into the cakes. While that may sound odd, trust me when I say that there were no complaints. 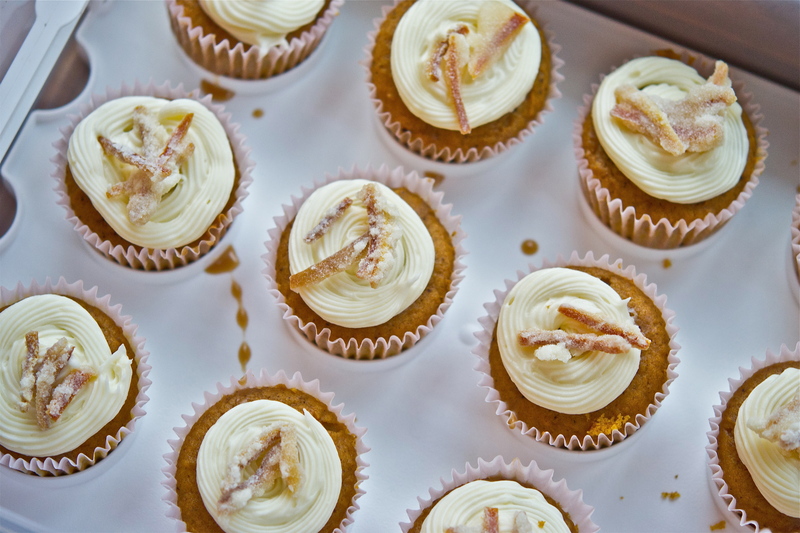 Click HERE to see the recipe for these elegant cupcakes! Kahlua + chocolate = gold medal. The edge of espresso really deepens the “chocolatey” nature of the ganache, and kahlua is sort of awesome all on it’s own; a win-win situation. And for those of you who are curious, the alcohol is NOT cooked out of the ganache (though a single tablespoon will have little if any effect, I can guarantee it). Topped with a mascarpone frosting, these were absolutely decadent. 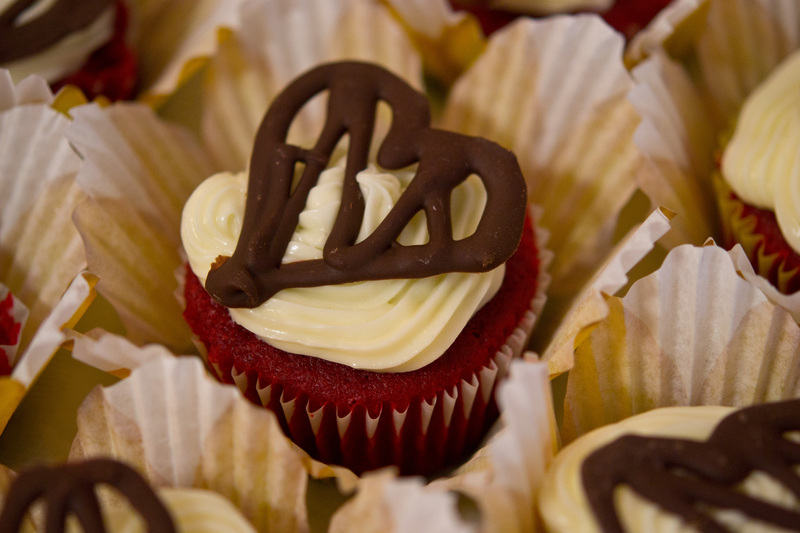 I topped each one with a chocolate music note, to honor the happy couple’s musical lifestyles 🙂 Click HERE to see the secret to making these indulgent cupcakes! When thinking about what to frost these with, I looked to a baker’s best friend: Marshmallow Fluff. I know what you’re thinking, but when it comes to cupcakes it is truly a godsend – it’s fun, sweet, and will make a frosting with the ideal piping consistency. 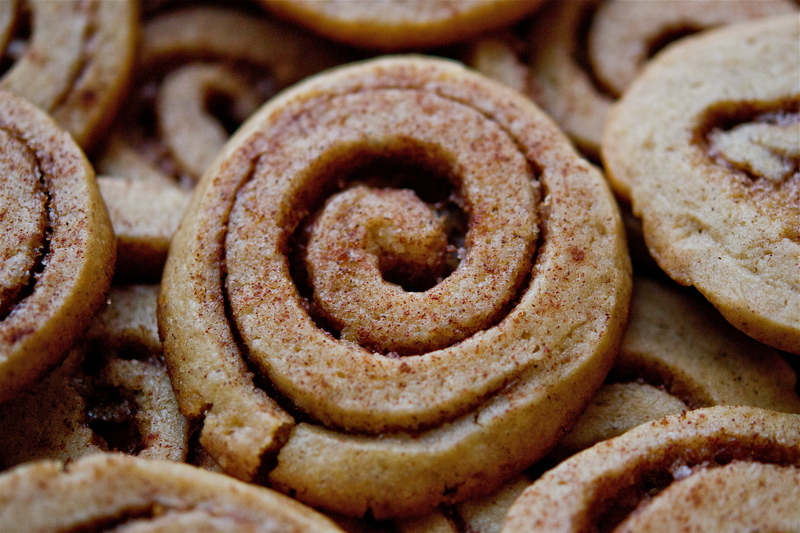 Of course, topping these with an actual Snickerdoodle cookie was just too good to resist. 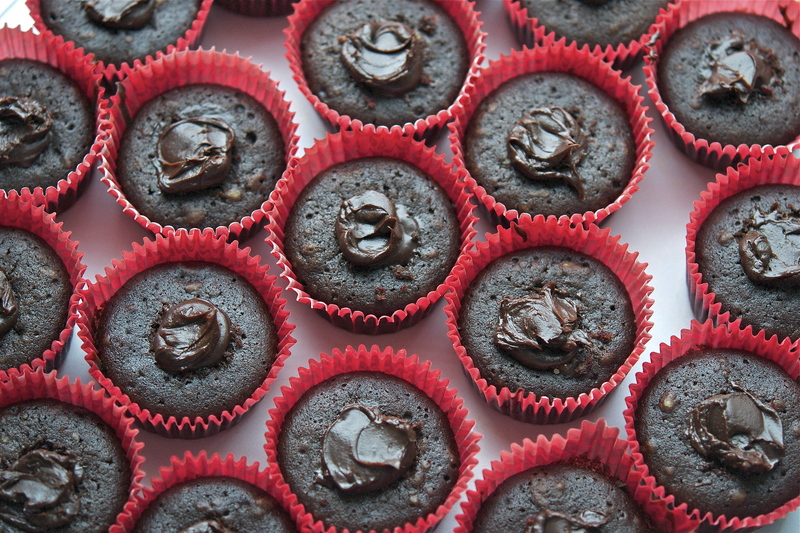 Click HERE to see the recipe for these fun little cakes! Princess Marie Therese von Werdenberg (The Marschallin) – an older woman who laments her early marriage to a Field Marshal. Octavian – the Maschallin’s young lover, who she elects to be the Knight of the Rose for her cousin Baron Ochs’ marriage announcement. Sophie – Sophie von Faninal, the fiancée of Baron Ochs who falls in love with Octavian. The trio is the moment where the three come together, knowing that Octavian must choose whether he continues to be The Marschallin’s lover or leaves to be with Sophie. It’s a beautiful scene that speaks to the undeniable power of love, and was the perfect start to a gorgeous ceremony. 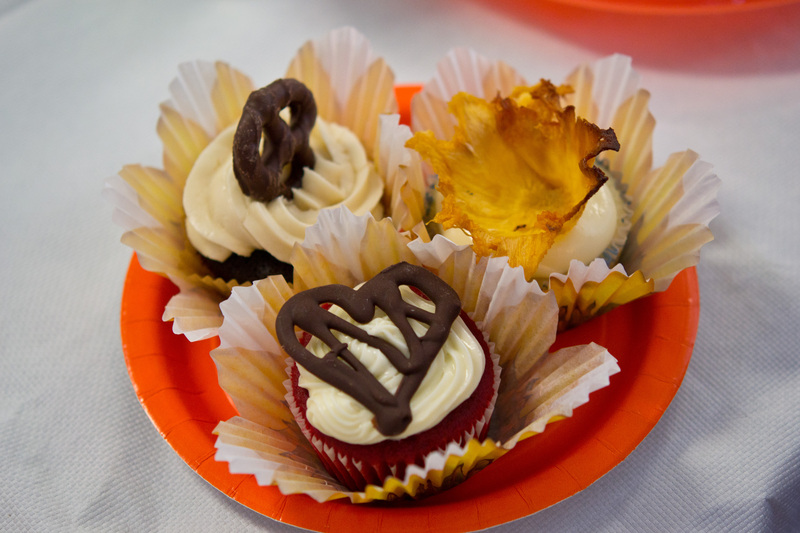 In terms of these cupcakes, each one can be paired to this trio of dynamic characters. The Pumpkin Cupcakes suit The Marschallin quite beautifully – not only are they elegant, but they are far more complex than meets the eye. Octavian has to be the Chocolate Cupcakes with Kahlua Ganache – he is “filled” with an irresistible passion for life, and a capacity for love that is unstoppable. 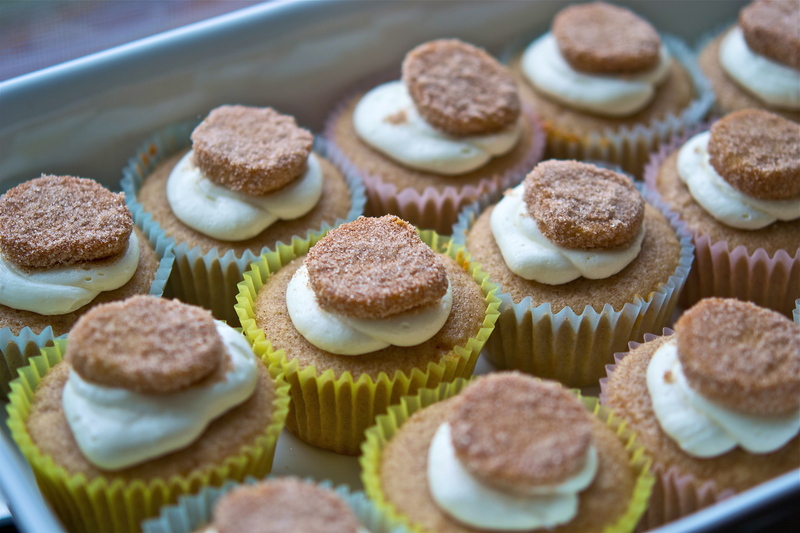 That leaves the Snickerdoodle Cupcakes for Sophie – a young woman whose heart and character are the definition of youth. The clip below is my personal favorite, with Anne Sophie von Otter (Octavian), Barbara Bonney (Sophie), and Felicity Lott (the Marschallin). To Robert and Brandon – I wish you all the happiness in the world, for I don’t know a couple who deserves it more than you. There is no doubt that the two of you are meant to be together, and I feel truly blessed for having had the opportunity to experience such a beautiful union – all my best. You might recall my insane task of baking 120 cupcakes for a wedding a few weeks back, but the result was awesome and totally worth it…yet it’s worth mentioning that I had also volunteered to bake cakes for the office’s birthday celebration three days later! Oops…I of course forgot about it, and had to resort to a crazy brainstorm session: ‘how about cookies? No, those won’t work…I can bring in cookies any old time…but wait, why not cookies…in cake form!” Following a mad dash of altering cookie recipes and finding a ridiculous amount of butter I was able to create two last-minute beauties: Chocolate Chip Cookie Cake with Peanut Butter Frosting and Chocolate Brownie Cake with Coconut-Almond Frosting. This cake is proof that freezers are necessary to our survival. You completely forget you are having friends over (or in my case, bringing in treats to the office)…yet suddenly remember that cookie batter you froze a few weeks back! It will need to thaw, but luckily I placed the dough into my fridge (to make space for ALL of those cupcakes). 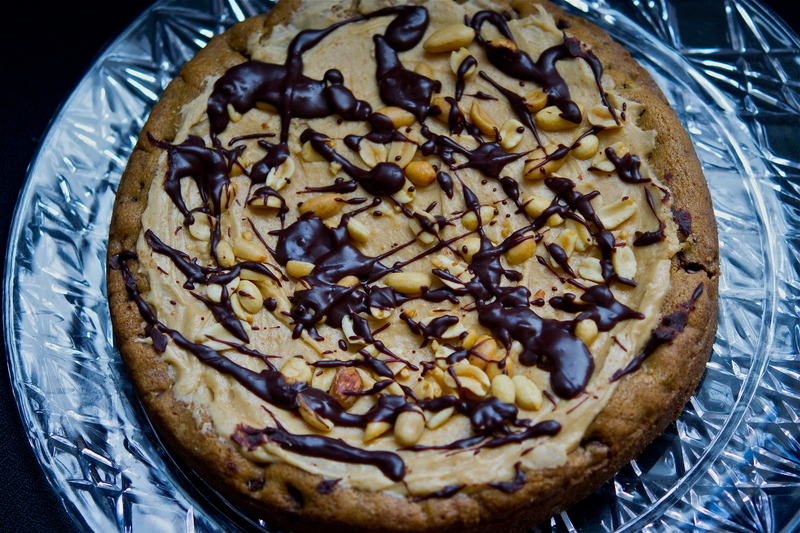 It’s one of the BEST chocolate chip cookie doughs I have found to date, and the peanut butter frosting was a no-brainer. 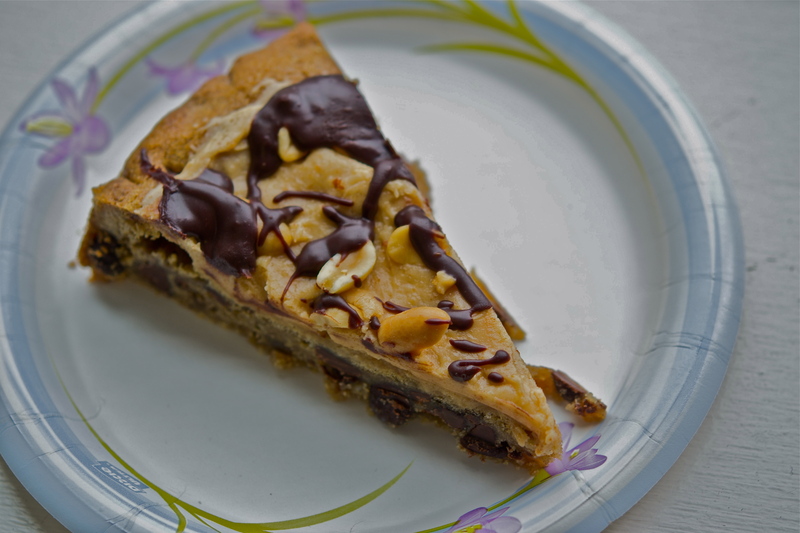 Anyone who doesn’t love a chocolate and peanut butter pairing should not be trusted (unless they are allergic to peanuts…they can still be trusted) Click HERE to see the secret behind this amazing cake! This next recipe was inspired by an “I-need-to-use-very-soon” bag of shredded coconut sitting in my pantry. I wanted something similar to an Almond Joy, mostly because I was secretly craving the actually candy…and somehow I decided on a brownie cake. 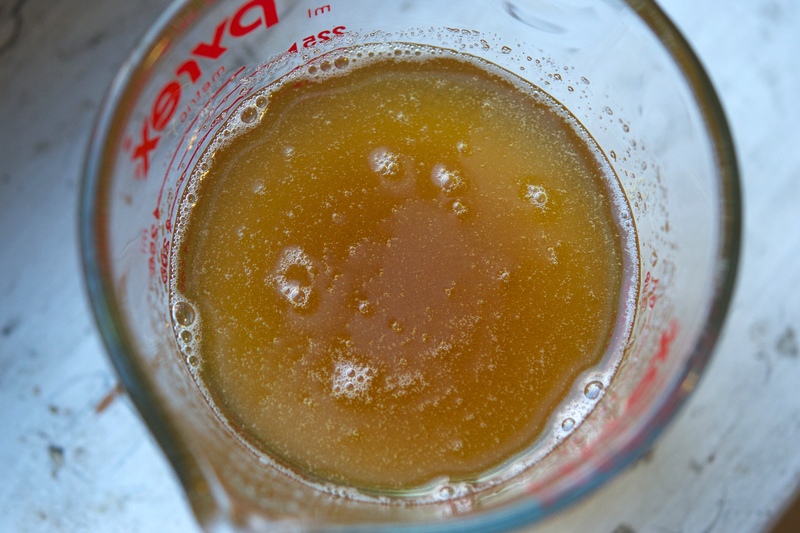 I modified the recipe that I just featured on this blog, trusting the result would be delicious. The topping is what makes this a winner, hands-down – it’s a spin on the frosting for German Chocolate Cake, only with almonds in place of pecans. The finished cake definitely reached my candy-craving standards. Get your Almond Joy fix by clicking HERE. I loved the idea of pairing these cakes with a work that was similarly “last-minute” in origin. 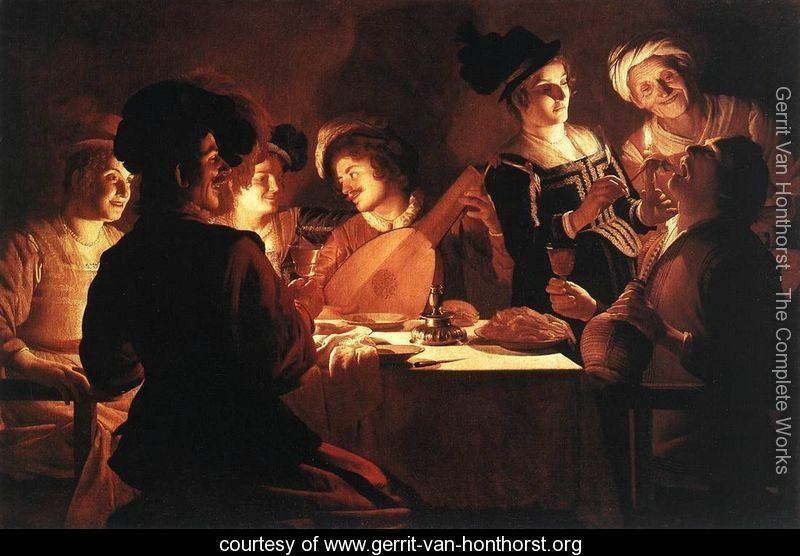 As a flutist, I immediately thought of the perfect piece – Mozart’s Flute Concerto No. 2 in D Major. A bit of history: flutist Ferdinand De Jean had commissioned Mozart to compose four flute quartets and three concerti…yet Mozart was the living representation of procrastination. So it was no surprise that only three quartets and two concerti were presented to De Jean for the commission. 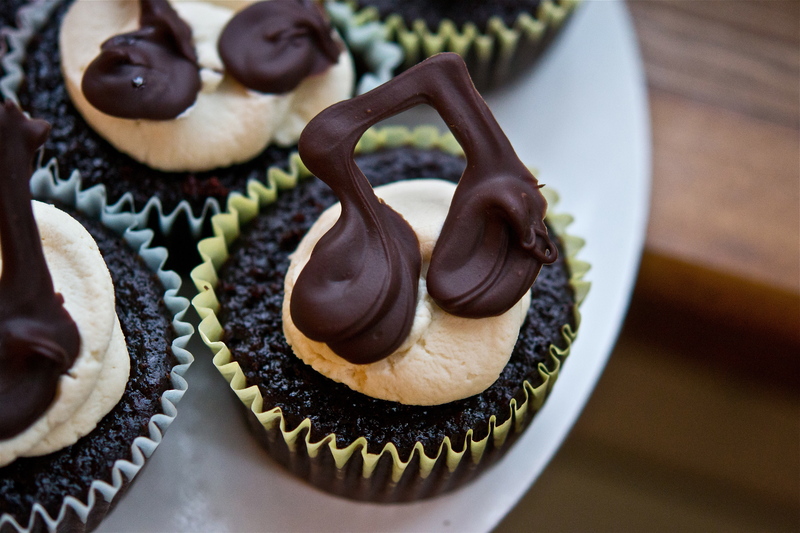 Yet like these cakes, Mozart pulled a work from his own “stock” of repertoire to complete it: the Oboe Concerto in C Major. He reworked the piece to fit the flute more appropriately, but basically transcribed the whole thing to D Major and handed it over to De Jean as a “flute concerto.” De Jean wasn’t fooled, and never paid for it. That being said, it has become vital to the flute repertoire and is undeniably beautiful. Sometimes, last-minute creations can be far greater than anything you could have planned (yet while this often worked for Mozart, I wouldn’t recommend it as a life practice…) The recording below is of the first movement with flutist James Galway – enjoy! We all grew up with the notion that our lives will lead to the iconic “happily ever after” – Disney can take ALL of the credit when it comes to my own history. Yet having seen that life doesn’t always brings you castles in the sky or a plethora of critters willing to clean your apartment, reality eventually kicks in and brings us to what our childhood equivalents had deemed the “real world”. Yet watching Elizabeth DeVore’s and Christopher Patrick Maguire’s wedding was about the closest thing I’ve ever seen to a fairtytale. They just married this past August in Promise City, Iowa (a fitting name) after two wonderful years together. 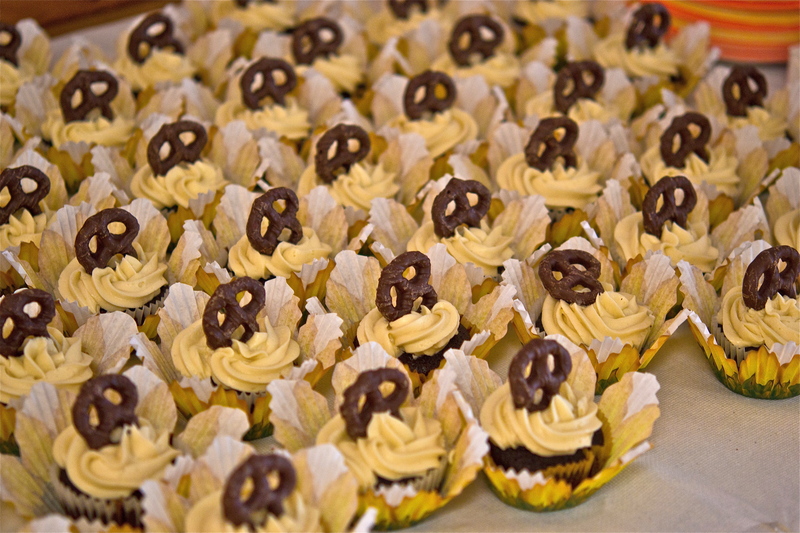 For their Boston celebration, they asked if I could cater the dessert course with cupcakes. 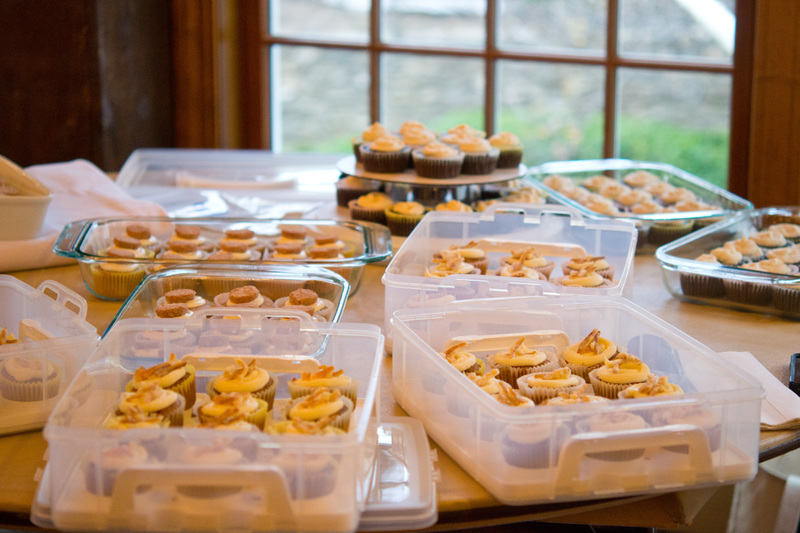 While I still can’t believe that I actually baked that many cupcakes, I was even more surprised at how well they went over – yet for Elizabeth and Chris, it was totally worth it. You don’t have to worry about taking a bite and instantly think “college frat party” – these aren’t like that at all. The chocolate’s flavor is beautifully enhanced by the stout, while the carbonation adds an effervescent quality to the batter. 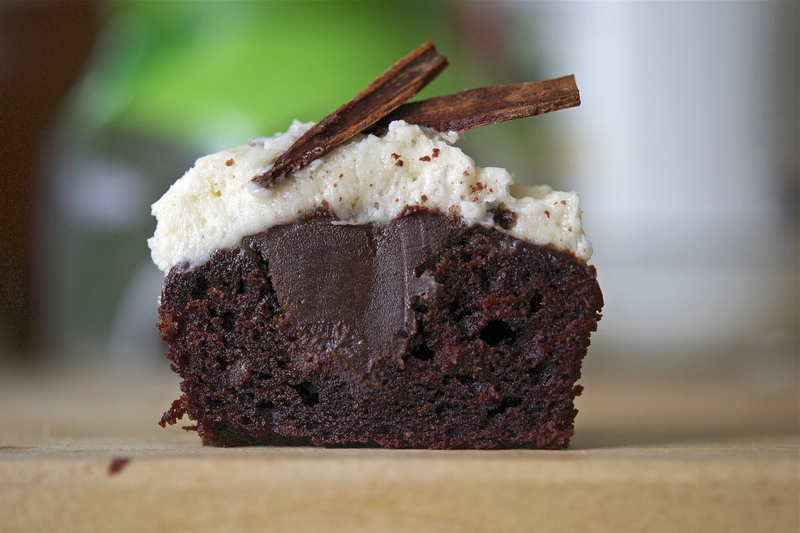 Yet don’t be fooled: like Guinness, these are hearty cupcakes, rich and dense – sure to satisfy anyone who loves chocolate. 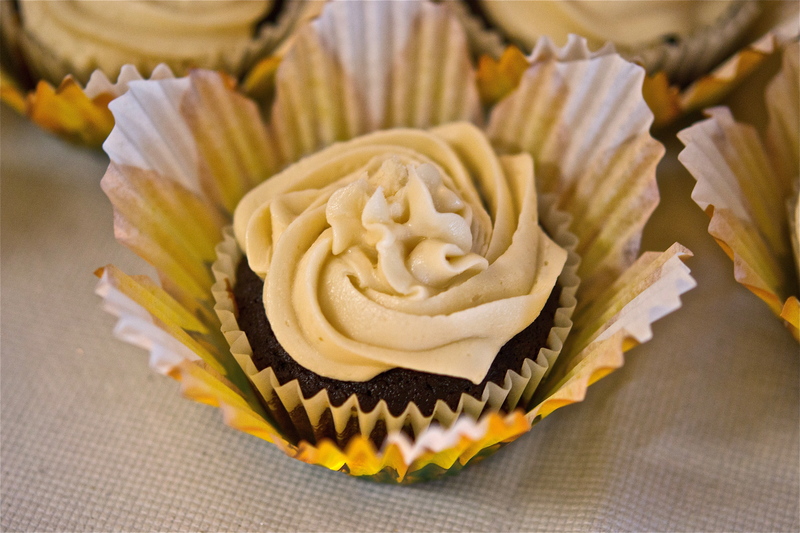 If you prefer to cloak the taste of stout, omit the Guinness from the frosting and replace it with milk or cream: click HERE to see the recipe for these rich, dark treats! 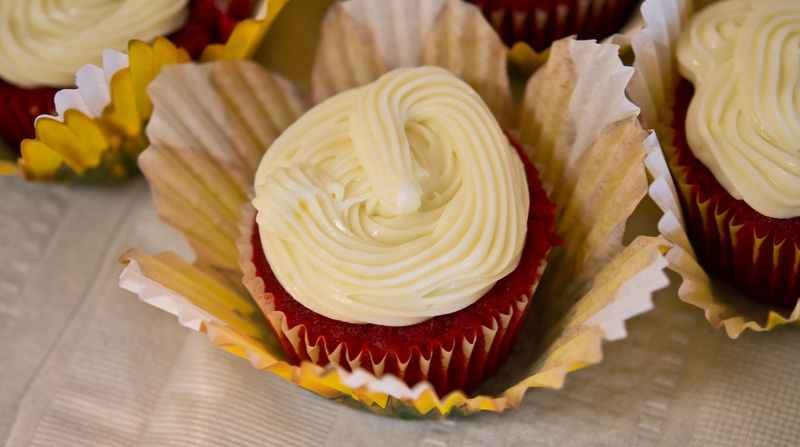 Red Velvet Cupcakes with Cream Cheese Frosting are a classic at any wedding – the scarlet cakes are dessert’s most popular exemplification of “true love.” What’s tricky about red velvet batter, though, is achieving that dark hue…you would be surprised at the amount of red food coloring it takes. I kept adding more thinking, ‘this just can’t be right…I must be going overboard!’ Yet the result was exactly what I had hoped for. Funny story about these: I made chocolate hearts for garnish by melting chocolate and piping it onto parchment sheets. When transporting them to the actual event, silly me forgot to put them into a refrigerator upon arrival…so I suddenly had a mangled mess of what used to look like perfect little hearts. Though I managed to salvage most, I was at least 10 garnishes short. I ran (in heels, of course) to the nearby corner store, bought 4 bars of Hershey’s special dark, ran back and quickly made additional garnishes. 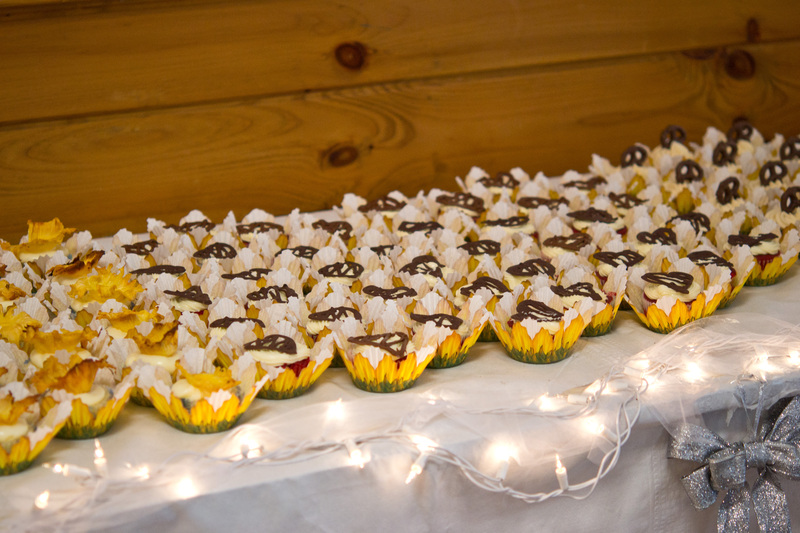 How this worked I will never know, but the fact that the bride didn’t find out until later that evening proves it was a complete success 🙂 Click HERE to see the recipe for these loving sweets! So I saved the best for last, and I say “best” because of the number of recipe requests and compliments for these Lemon Buttermilk Cupcakes with Cream Cheese Frosting. I actually thought these would be the “leftover” flavor, but there were hardly any to be seen by the end of the reception. The cake is perfect – just the right amount of lemon with a beautifully tender crumb, with a cream cheese frosting to round it all out. 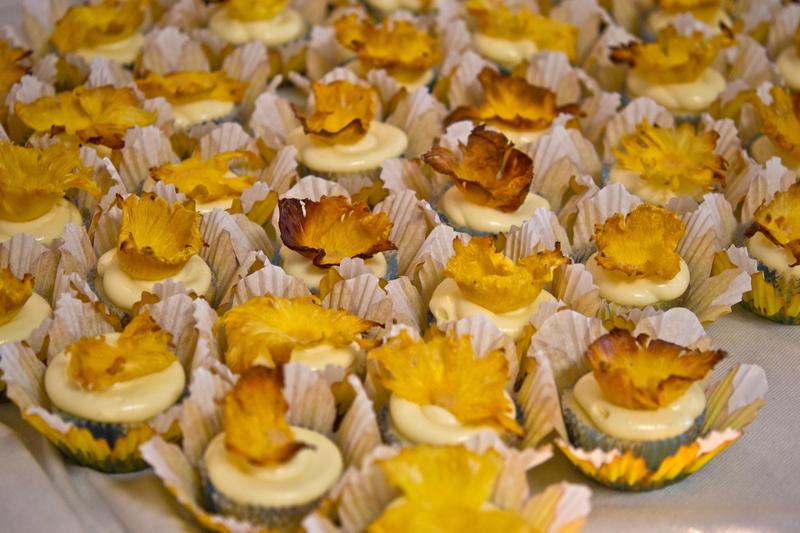 Their true beauty was thanks to the garnish: a pineapple flower. 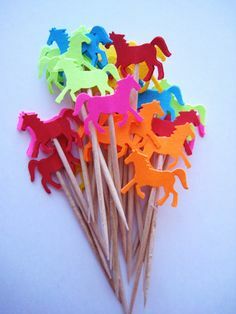 When I saw this adorable idea (a Martha Stewart creation, no less), I knew it would be perfect for the occasion. I didn’t realize that it would also be quite messy and time-consuming (though not as much as the frosting undertaking, ahem)…but the result was absolutely perfect! 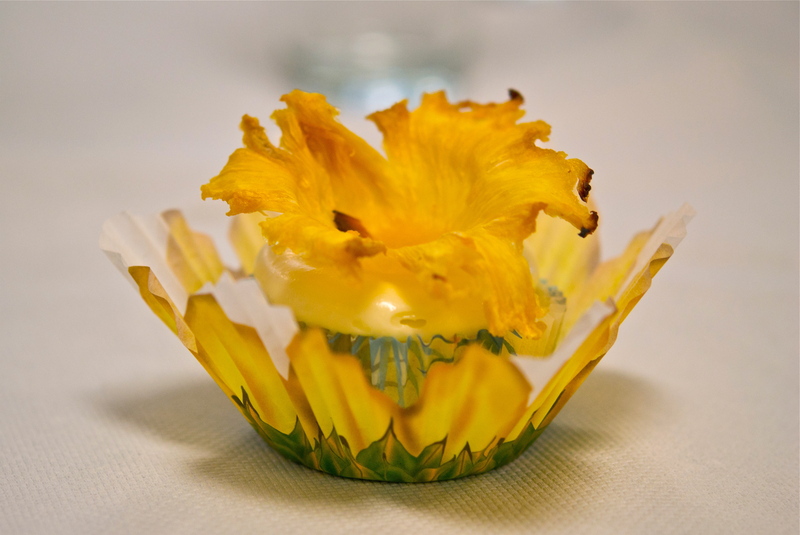 Aside from their visual appeal, they were also quite delicious (I’ve always against non-edible garnishes…) So all-in-all, these took the trophy for “best cupcake of the day” – click HERE to see how to make these show-stopping beauties! The musical pairing for this was a no-brainer – as you read from the beginning of this post, Elizabeth and Chris have a love that is truly remarkable. They have both been through some really tough times, and yet their devotion has never waned. The wedding was, in a word, “magical” – both the bride and the groom were glowing, from the start of the ceremony to the end of the party. I don’t think I saw a single moment where they weren’t simply beaming. For the service itself, they asked Christopher O’Riley (host of From the Top, and a close friend) to perform. During the Sand Ceremony, he played his arrangement of Radiohead’s True Love Waits…this song is too perfect, and I couldn’t think of anything that would be better suited for this post. While I still can’t say that I believe in fairytales, Elizabeth and Chris have certainly proved that dreams can come true – enjoy! Make-ahead: a term that ANY host loves to see in a recipe. No stress, no mess – just the simple task of cutting or baking, and you’re done. Desserts, thankfully, often fall within this category (an exception would include bananas foster, but those are sooo worth the added effort). Avoiding the use of an oven at a party is alway a great idea – you don’t want a bunch of sweaty, hungry guests…trust me, it’s not a pretty picture. So when I discovered these Lime Meltaways and Supernatural Brownies, I all but jumped at the opportunity to make them…and trust me when I say that my friends all but jumped onto the plates these were served upon. 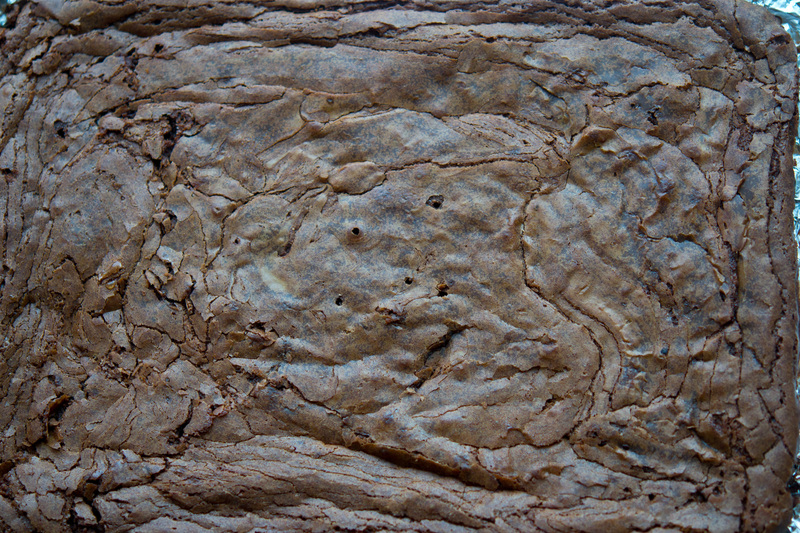 Let’s talk chocolate for a moment – there are few things more beautiful than a 9×11 block of dense, fudgy brownies. This recipe is a true winner – two types of sugar create a moist texture, while melted bittersweet chocolate permeates the batter with a rich and palpable taste. The recipe for these had gone “blog viral” – in other words, a number of baking blogs and recipe platforms had showcased these, with endless praises; I decided to take the hint and give these a shot. 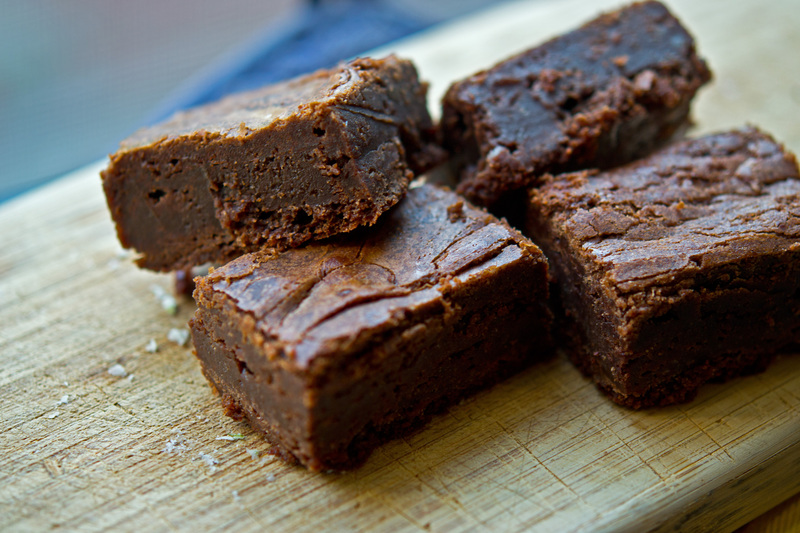 The baked result has a delicate crust, beneath which is the gorgeously tender brownie. Surprisingly, they don’t have the typical dark hue common to brownies – they are somewhat lighter, but trust me when I say the flavor has just as much depth. While these do take a while to bake, it is absolutely crucial to NOT overbake these – nothing is worst than a chalky brownie Click HERE to see the recipe for these showstopping treats! 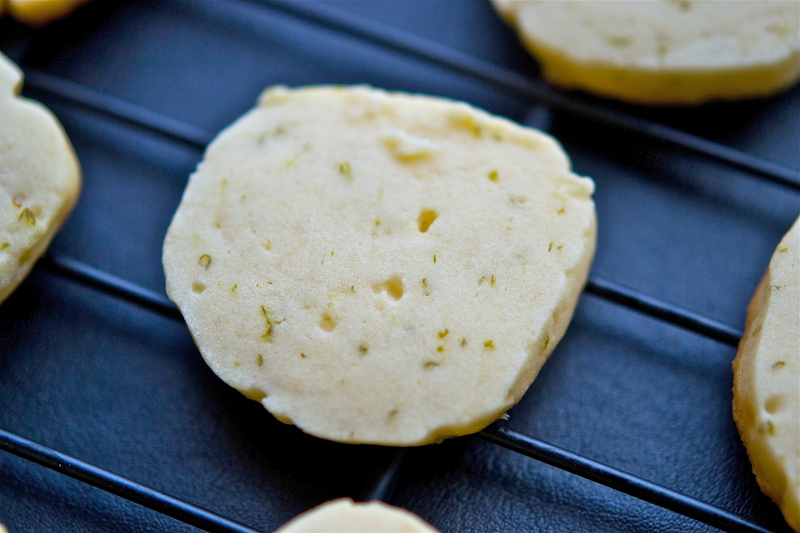 If I had to list my favorite type of cookie, it would have to be shortbread: not too sweet, with a buttery crunch that never fails to make you “melt.” These cookies were just that – lime + sugar = awesome. The best thing about this cookie is that once you roll the dough into a “log,” it can refrigerated up to a week or frozen for up to three months! 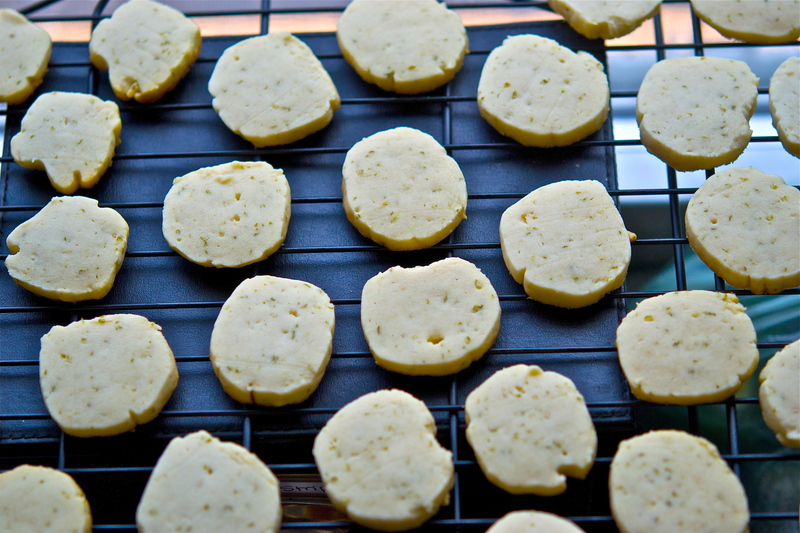 This gives a major boost to the convenience and flavor of these cookies. 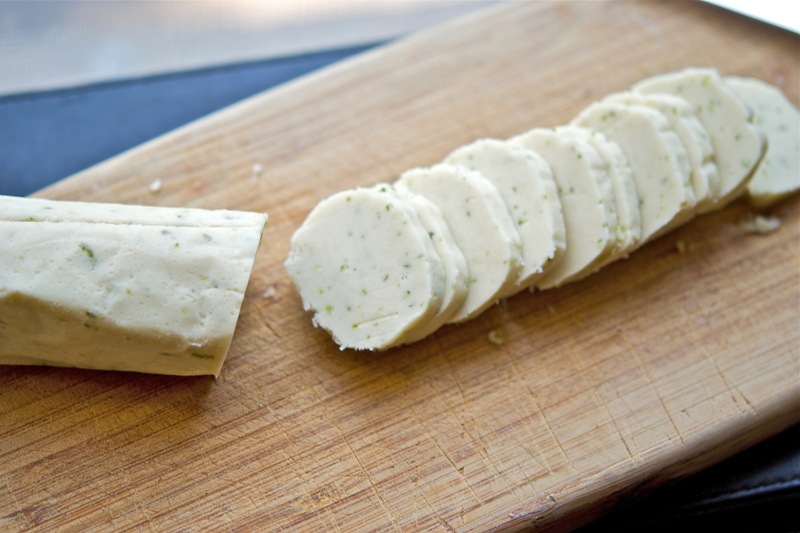 You can find the recipe for these zesty treat HERE. At the same time, I felt the music to be aesthetically appropriate – the modal shifts present a wealth of flavors, yet it’s complexity is never overbearing. It is one of those pieces you can imagine listening to on rainy day with your eyes closed, savoring each moment as though it were a delicious treat. The following video is with Gloria Cheng-Cochran (it has been separated into three separate videos by YouTube, so this is only part of the work – I have included links for the second and third installments below the embedded video.) Enjoy! So I am definitely behind on this post, but I place the blame on my incessant touring as an excuse for not having the chance to devote a post to moms for Mother’s Day. 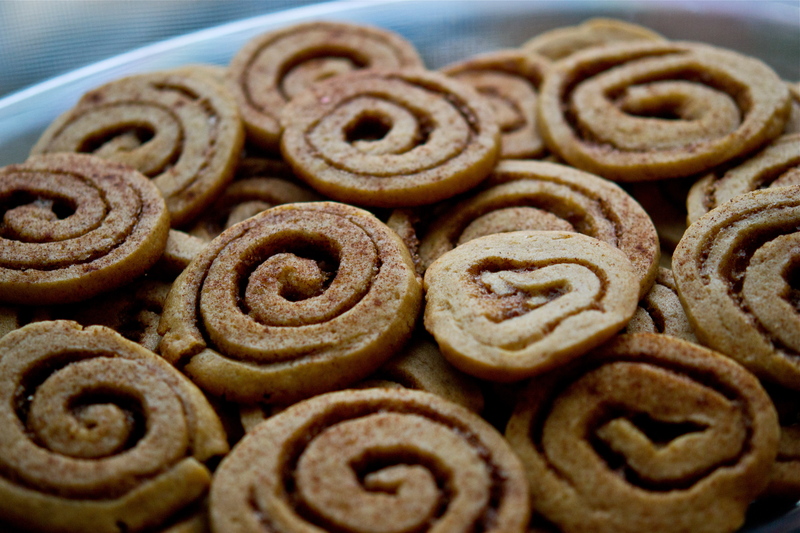 Many of us cherish those memories (complete with blurry edges a la Hollywood) where we ran inside from a day of play or school to the smell of freshly baked cookies. They say smell is the strongest catalyst of memory, with the majority of those connections being formed in our childhood. 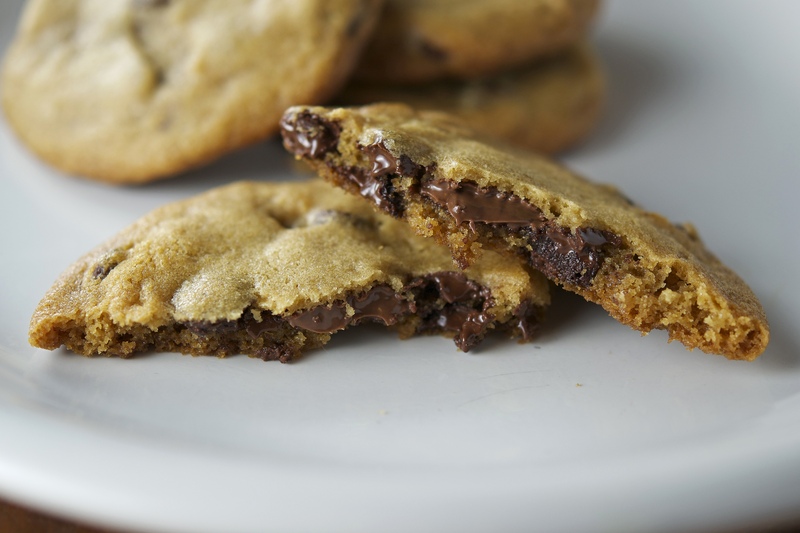 This is due to the connection of the olfactory bulb (the part of our brain that processes odor) to the ever-powerful amygdala…I should probably stop while I’m ahead and talk about this irresistible pair of cookie recipes: Chocolate Chunk Cookies and Chocolate Mocha Cookies with Nutella. I’m often asked why I don’t eat all the desserts I make. For starters, I would basically be eating cookies and cakes for breakfast, lunch and dinner if I actually ate everything I made. But my secret indulgence? Once whatever it is I’m making is done and in the oven, guess who gets to clean the beaters 😉 And cookie dough is probably one of the most addictive things on the planet…and this dough was uhhhhhh-mazing! 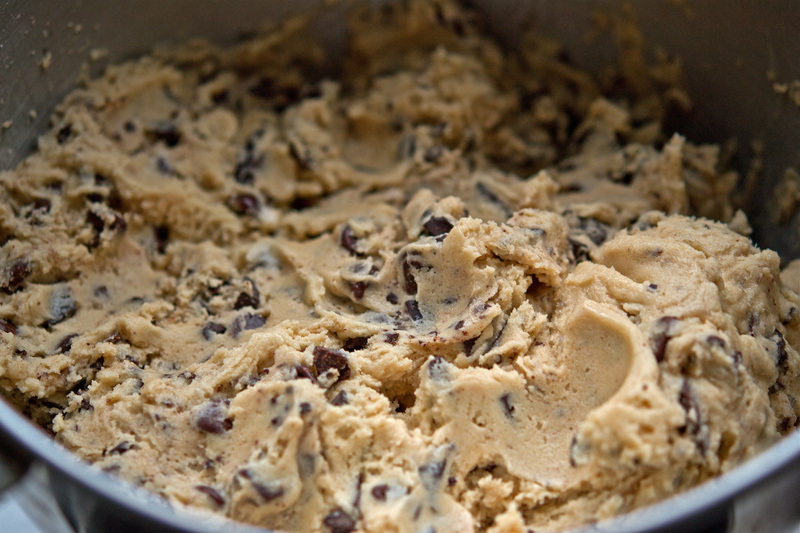 If you are one of the proclaimed few who can’t resist eating cookie dough, enlist help from a friend to make sure these cookies actually make it to the oven. That being said, the finished cookies were fabulous! Loaded with melty chunks and chips of dark chocolate, they are pure heaven. The cookie itself has a buttery crunch, with a tender crumb that makes your heart melt. 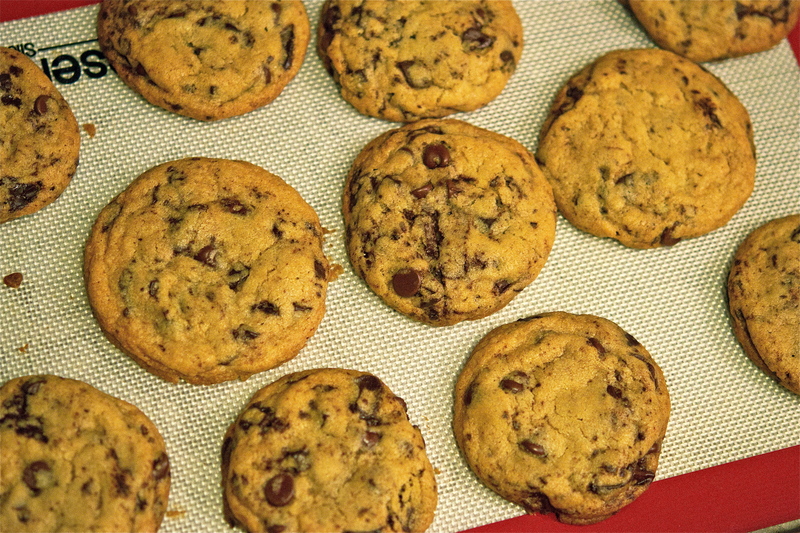 It goes without saying, but chocolate chunk cookies are best straight out of the oven (as they always have been) – click HERE to see the recipe for these golden, chewy delights! 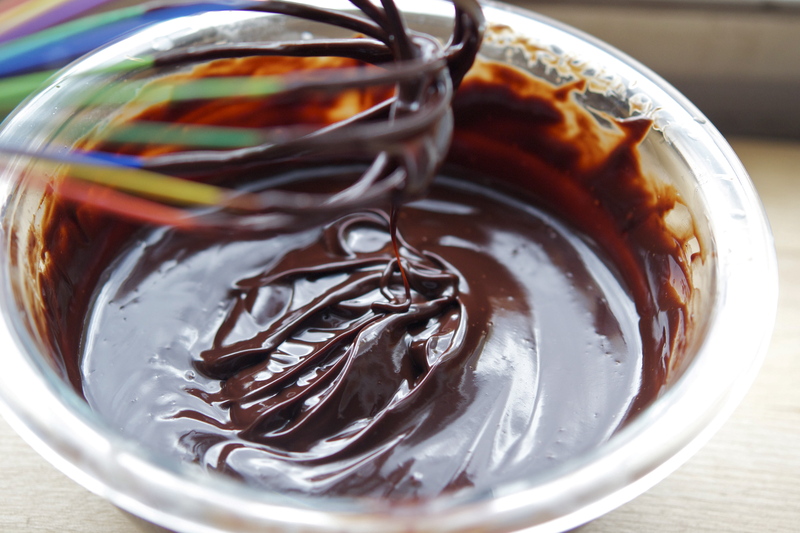 So now that I have you thinking about chocolate, how about taking it a step further with melted chocolate, cocoa powder, AND nutella…how can anyone resist? These cookies are more brownie than cookie, with a rich center and a crumbly edge. They also have a touch of espresso, which is only “topped” by the the nutella swirl to finish – the ultimate cookie. It may not be quite like the cookies (or brownies) we enjoyed as kids, but a cookie always has a way to make us reminisce over our childhood days – click HERE to see the recipe for this glorious sweet. Though short, the music is filled with color and life that other songs don’t quite achieve – a perfect way to describe two cookies whose size don’t quite speak to their ultimate potential. I’ve included a recording with soprano Anna Netrebko – enjoy!